It is ten past seven in the morning. After about an hour´s worth of preparations ranging from eating a good breakfast to checking tire pressure and to stocking up my saddle bag with bananas, chocolate rolls and ready made cocoa drink, I set off in what one might call promising weather: Not too much wind, sunshine, six degrees Centigrade reinforced by a weather forecast that might have sprung from a dream. After the longest winter ever in our area, today is going to be one of the first really nice days, and I´m determined to make the best of it. I am soon to find out that spring is really here. 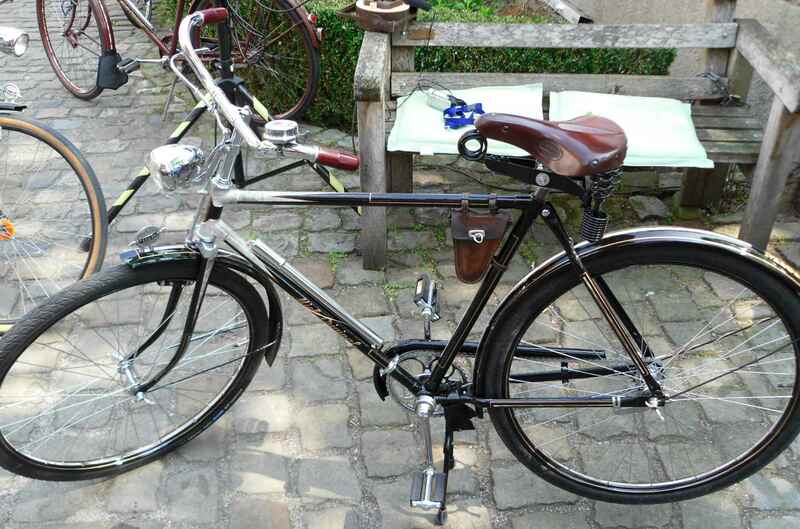 My steed for today is the 1930 Miele Model 2 based tourer described in an earlier post ( https://starostneradost.wordpress.com/2012/09/18/a-teaser/ ), and equipped with a mix of 1930s parts plus a tried and tested Brooks. 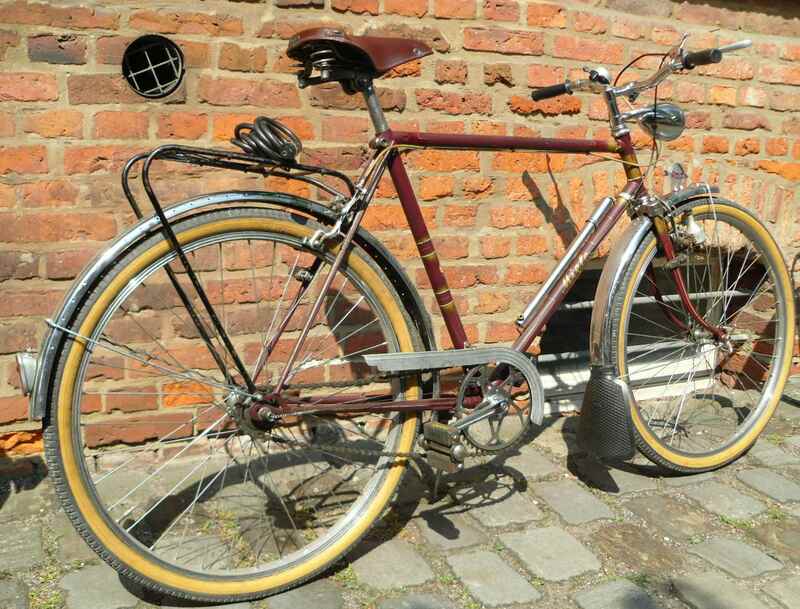 It´s something of a bitser because the 1930 frame has late 30s mudguards and even a number of modern parts to make cycling easier, culminating in Shimano SPD pedals. 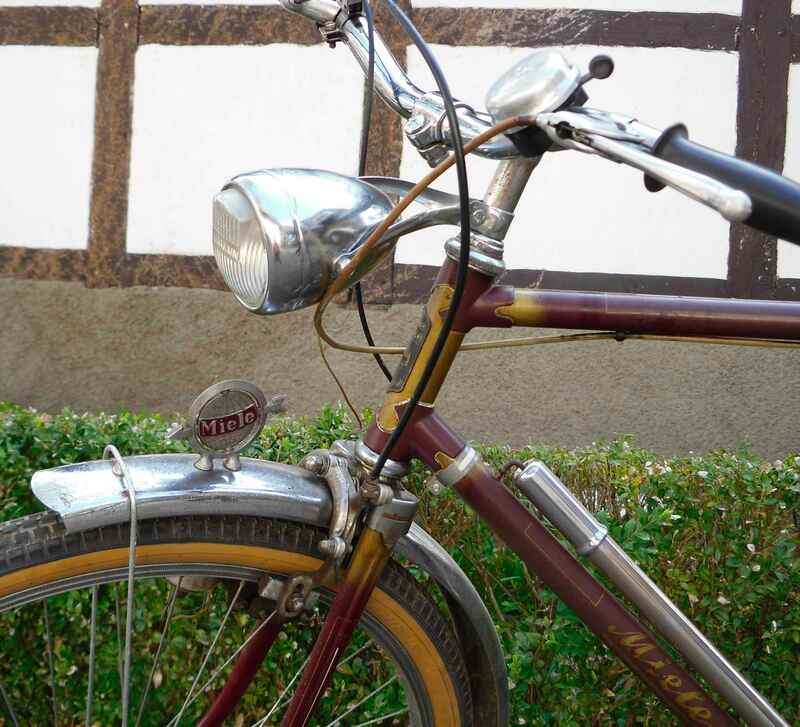 I have also added a modern feeder bottle with a band on cage and a simple cycle computer giving speed and distance readings, because my aim for today is to cycle to Gütersloh, about 60 km away, take part in the Miele bicycle meeting, and return on my bike, too. 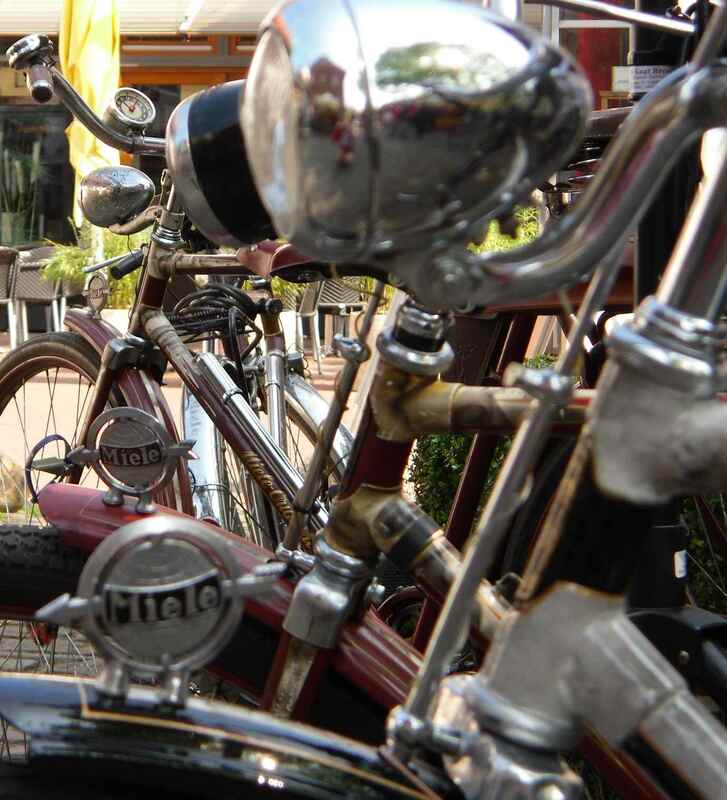 As there will be an outing on the bikes during the meet, the day will hold about 140 km of roadster riding. 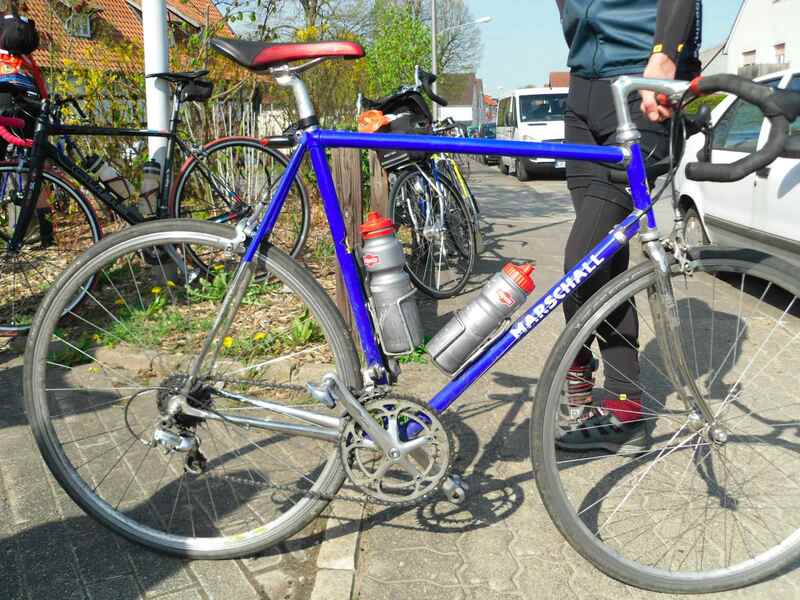 The headwind is not very noticeable, and I zoom along at a steady 28 kph, which is about what I can expect of both myself and the heavy bike which sports steel rimmed 635 wheels. 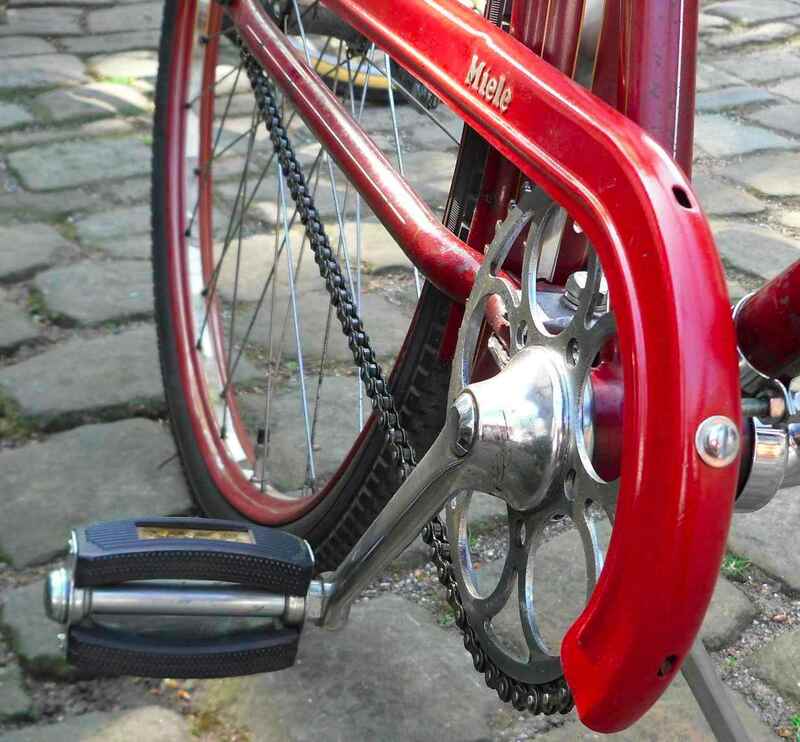 I can ride up hills which others have to push giving myself a good feeling as my Miele, which is now equipped with a more or less contemporary two speed coaster brake Doppeltorpedo, has far less suitable gears than many of the cycles I encounter. This snap was taken on the way back, so I have already cycled up this incline in the morning. 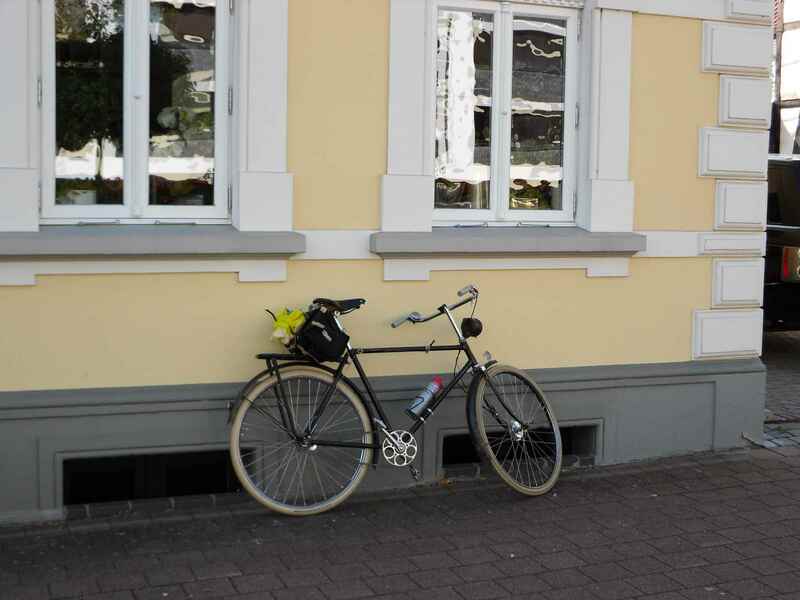 After about two and a half hours I arrive at Gütersloh. I am rather early, but already there are some participants there. 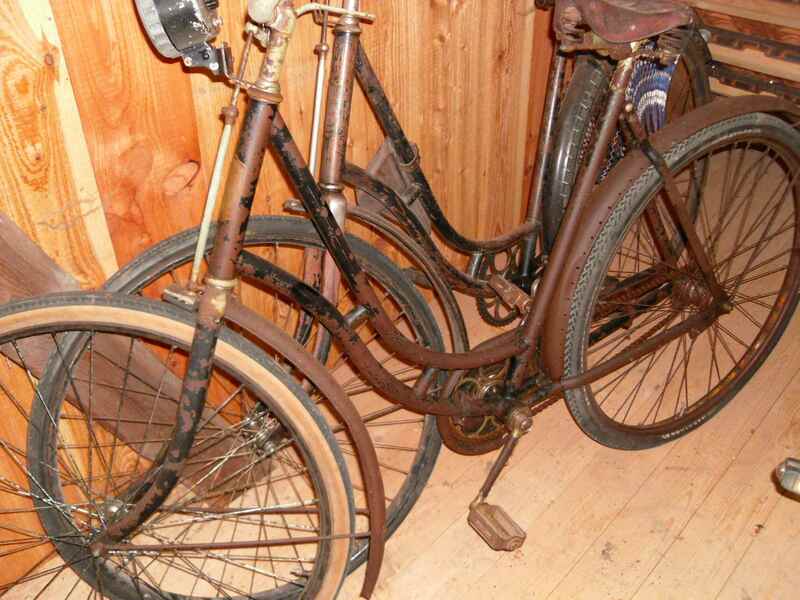 These two bikes are typical for what to expect, as I soon find out. 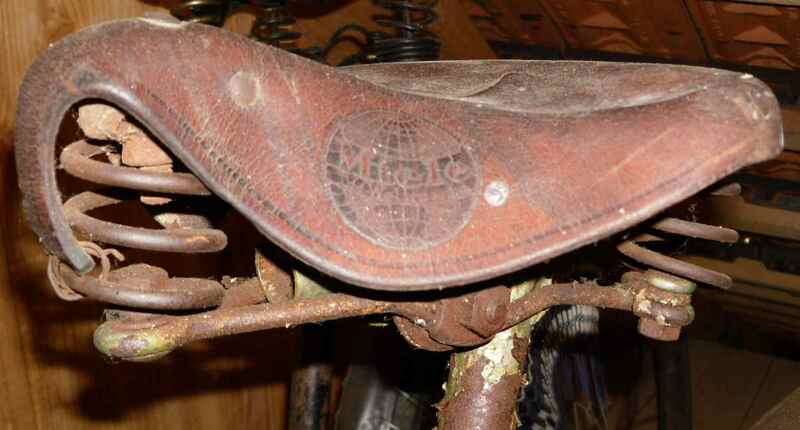 Yes, certainly, the cycles are recognizable as Mieles, but time has taken its toll in the way of bits and pieces having been replaced and others added, with few owners making an attempt at attaining originality, or even recognizing that something is amiss. 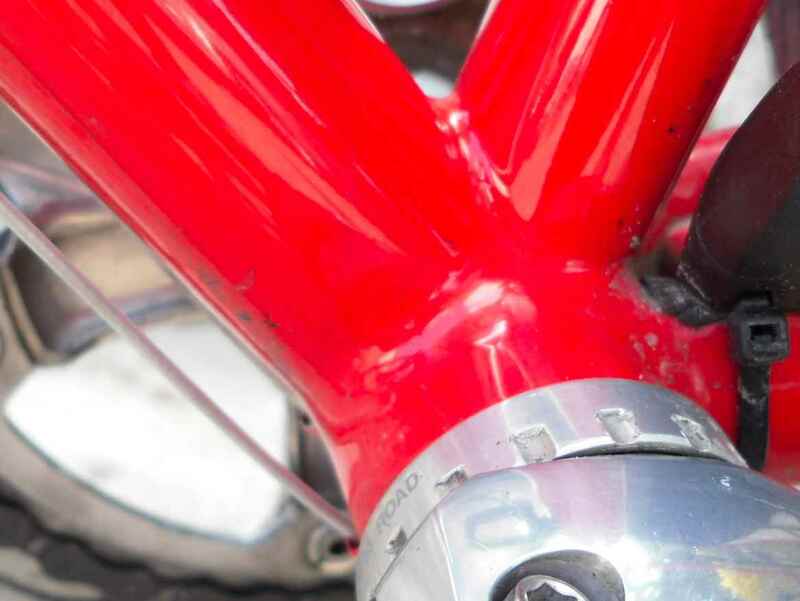 You will find 1970s headlamps on 1950s bikes, plastic spoke reflectors or even modern plastic gel filled saddles. 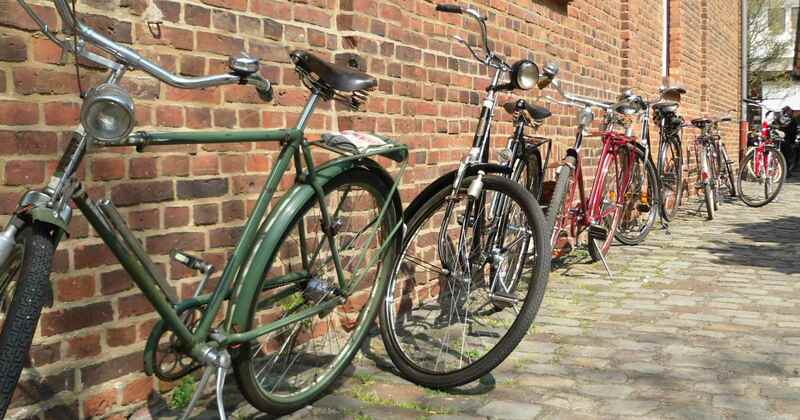 If this means that the bikes are in regular use it must be excused, but I´m not too sure of the mileage those bikes are clocking up. 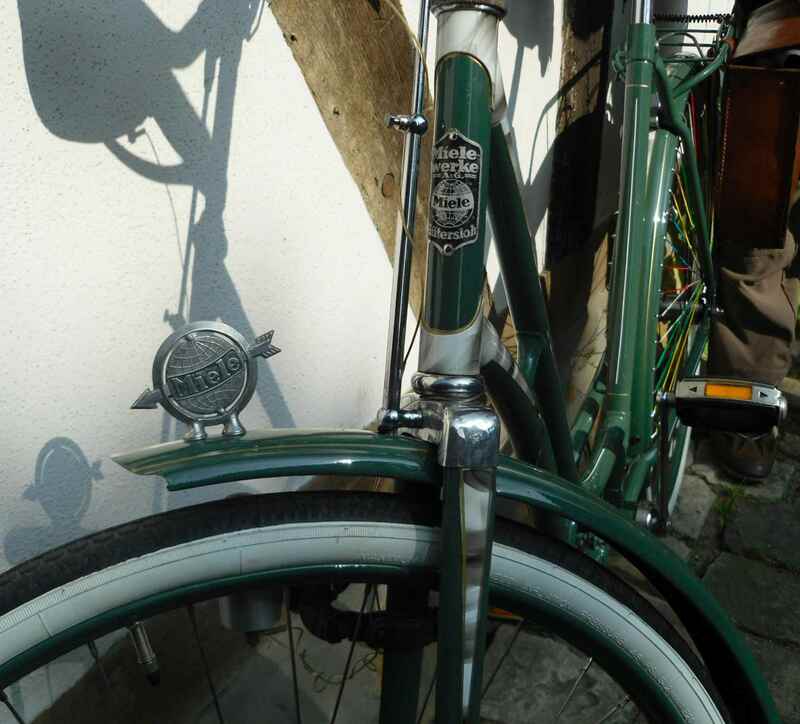 Of course, my bike is the worst of them all, having the oldest frame of all attendants, even equipped with a “Miele Bielefeld” headbadge (see below for an explanation), and yet it has all the modern parts I listed above. There´s something I personally can´t bear at all, however. 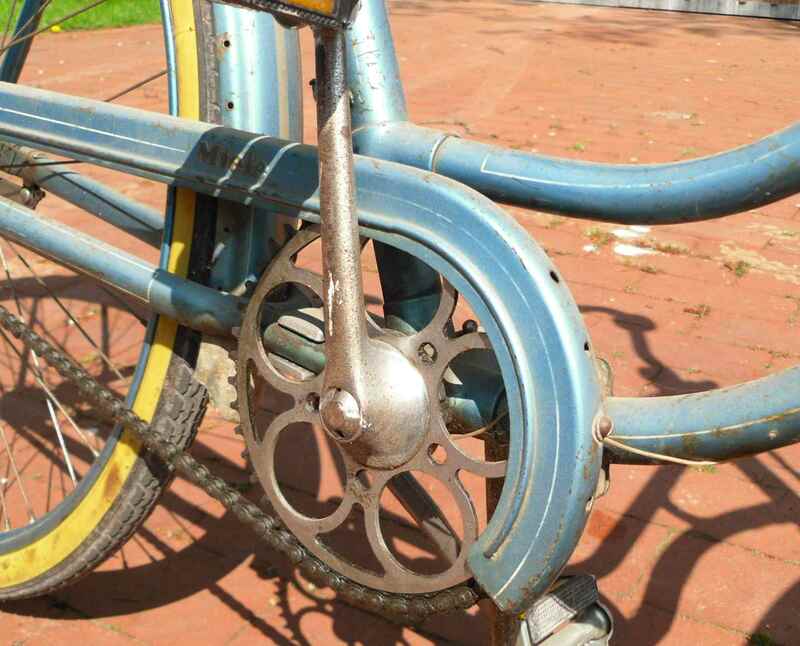 There are so many old German bikes with flattened chain stays where the aftermarket kick stands go, and it is to be feared that this meticulously restored bike will soon join their ranks. 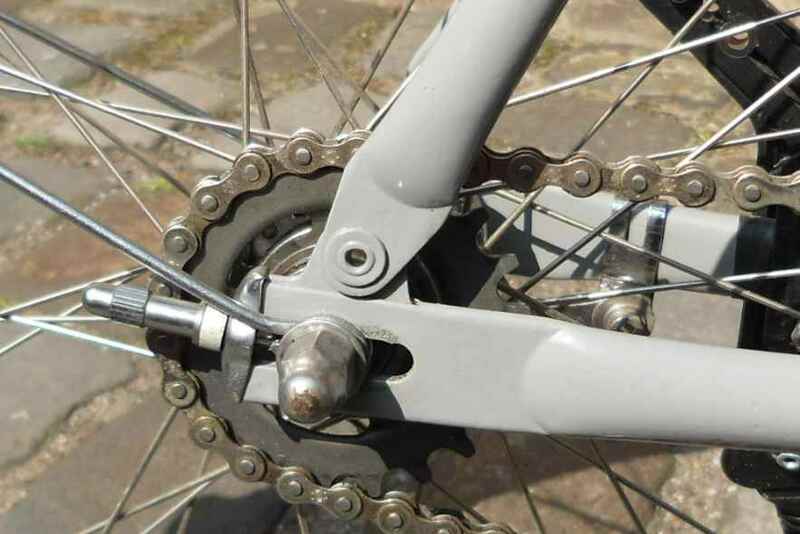 Permanently altering the frame is something I definitively shy away from, so perhaps I will be forgiven the Shimano pedals after all. 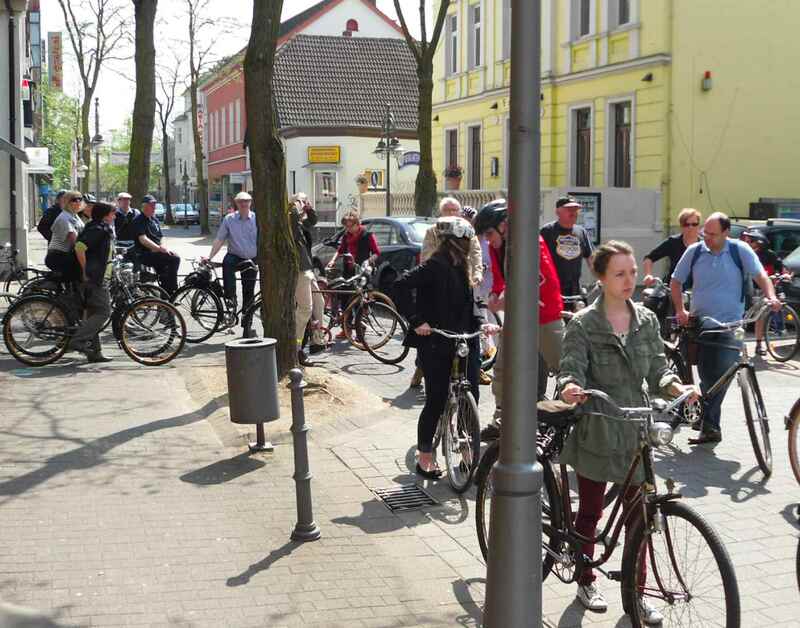 More and more participants arrive, our number is soon to exceed the 50 mark. 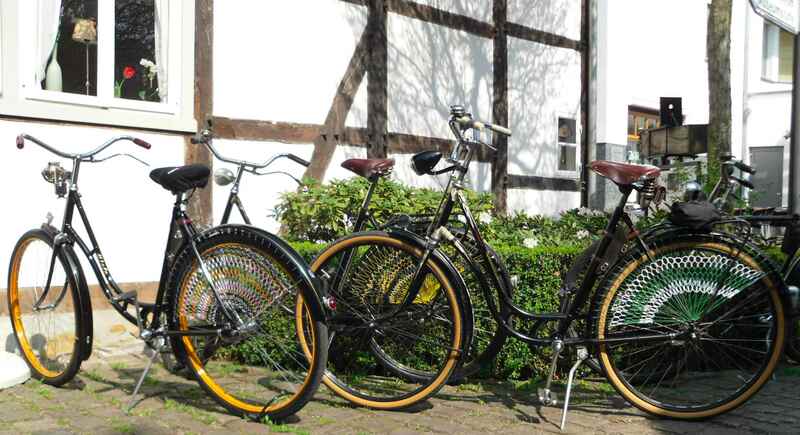 The little square behind Gütersloh municipal museum is soon filled with Miele cycles, and photographing is getting more and more difficult. Even a member of the Miele Sports Group arrives. 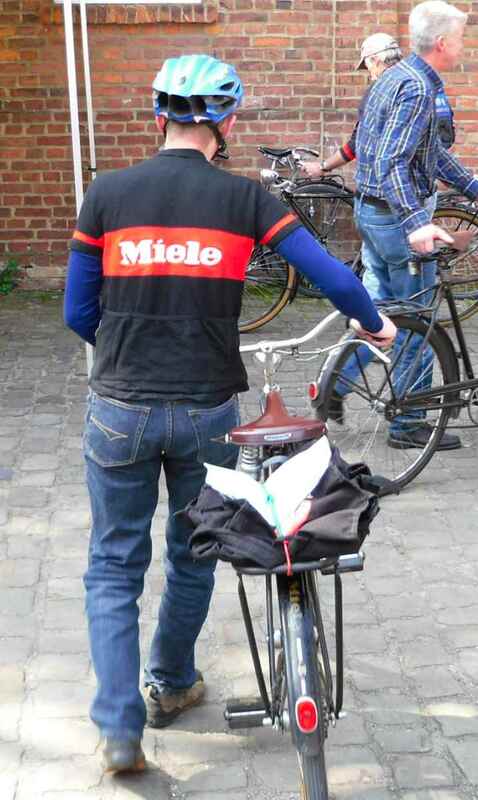 These people undertake long rides (Vätternrundan, Elfstedentocht, RVV and so on) on their Miele bikes. 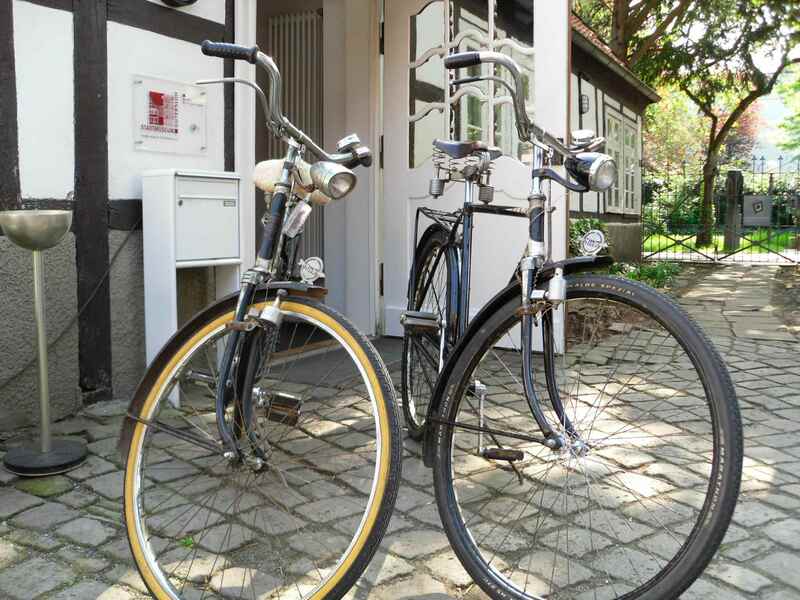 A number of bikes are rather interesting, for one or the other reason. 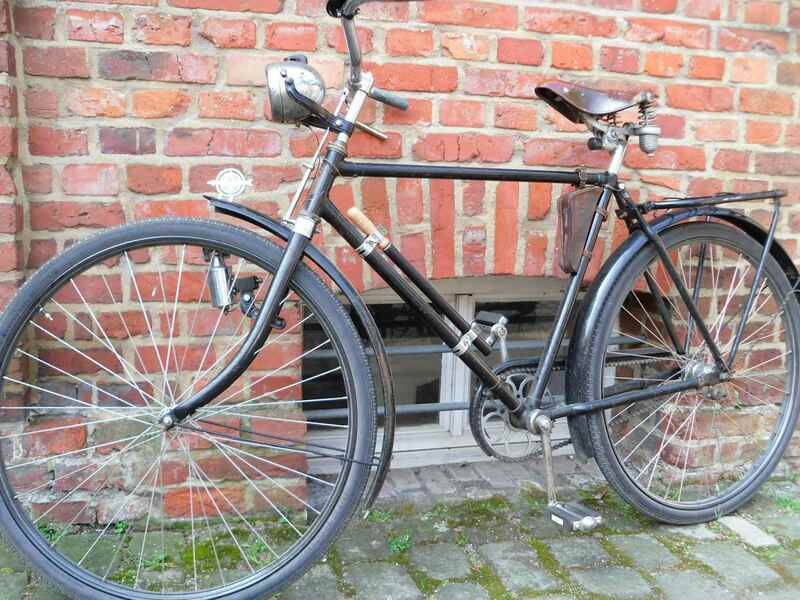 There´s this 1935 specimen, for instance. 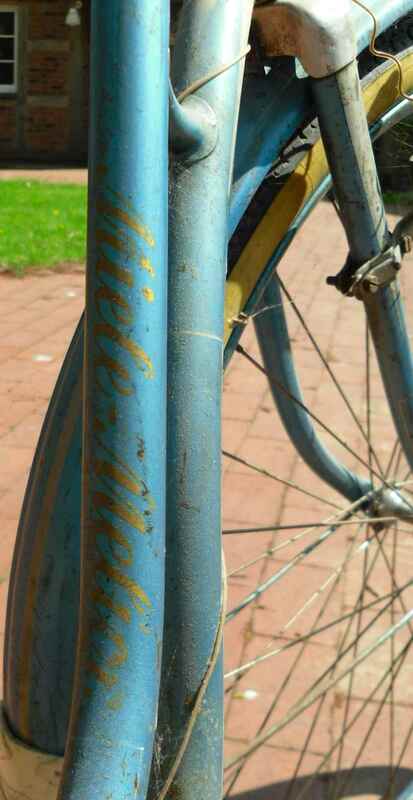 It has a wonderful Miele marked headlight, but alas its frame is badly bent. 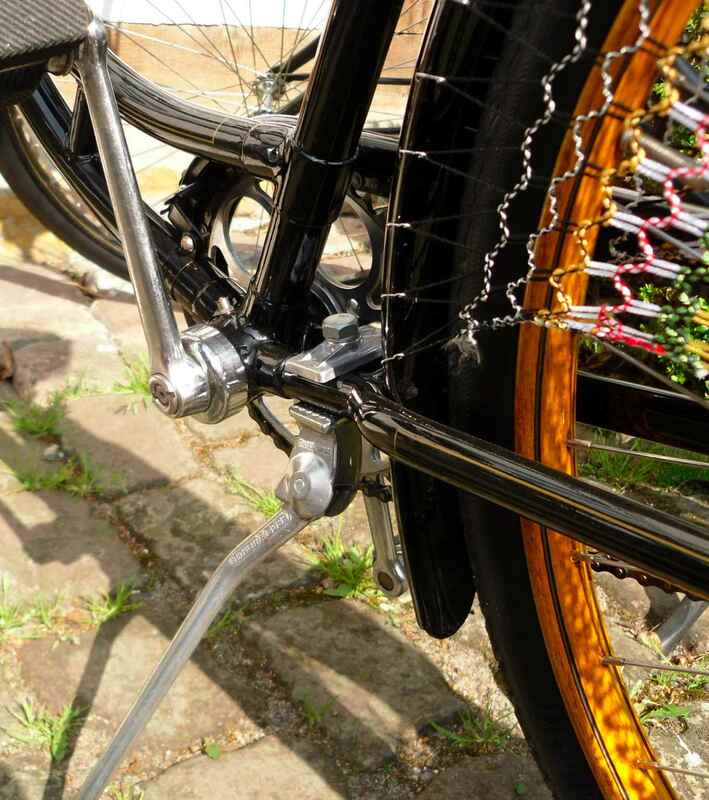 And dog help the rider if this loose bottle type dynamo should ever hit the spokes. I only noticed when checking the photos at home. 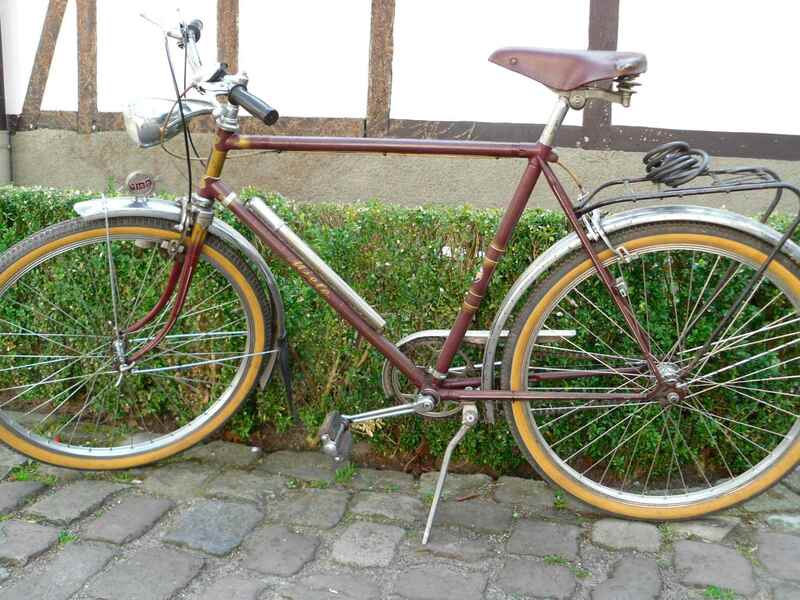 Then there´s this great late fifties Sports bike. 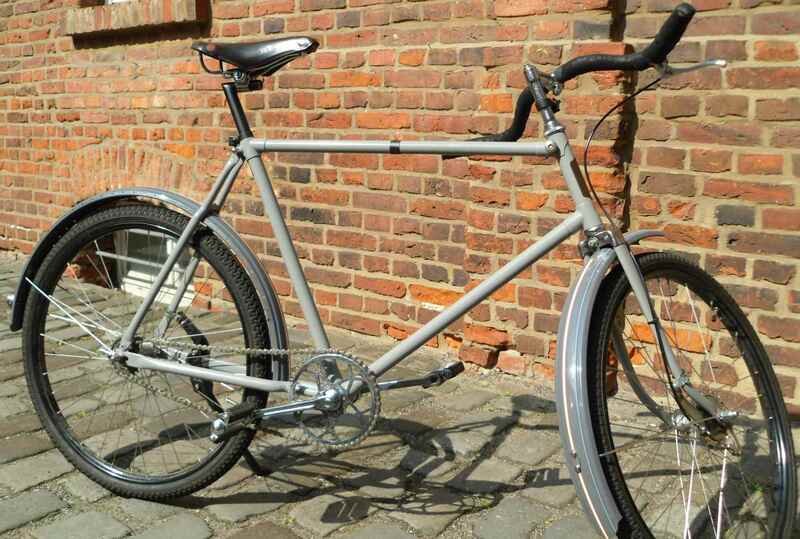 It is special in that it breaks with another German tradition: The coaster brake. 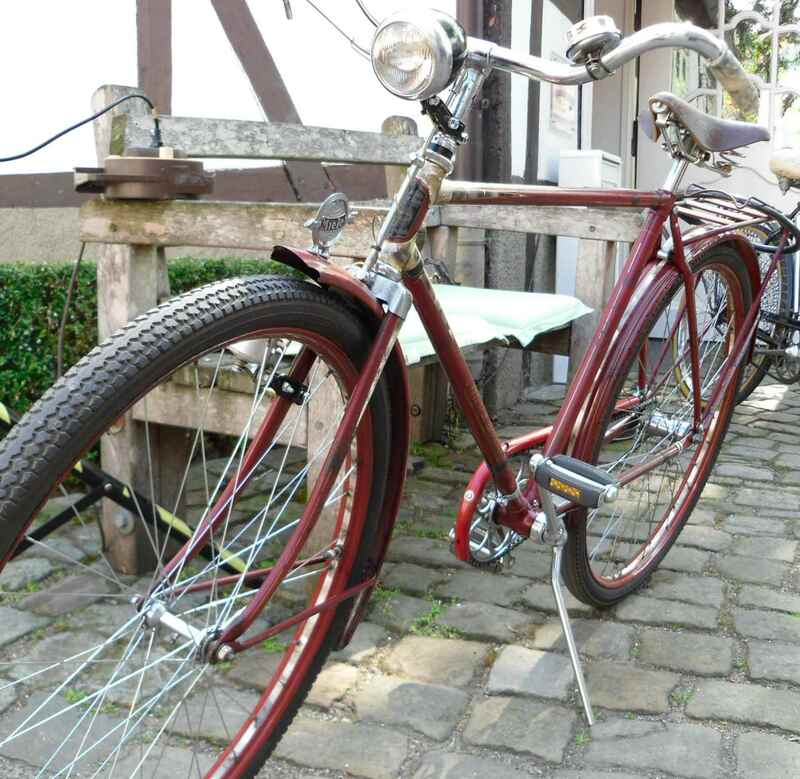 This bike has an early sixties Fichtel & Sachs 415 three speed without a coaster brake, making it stick out of the bunch. 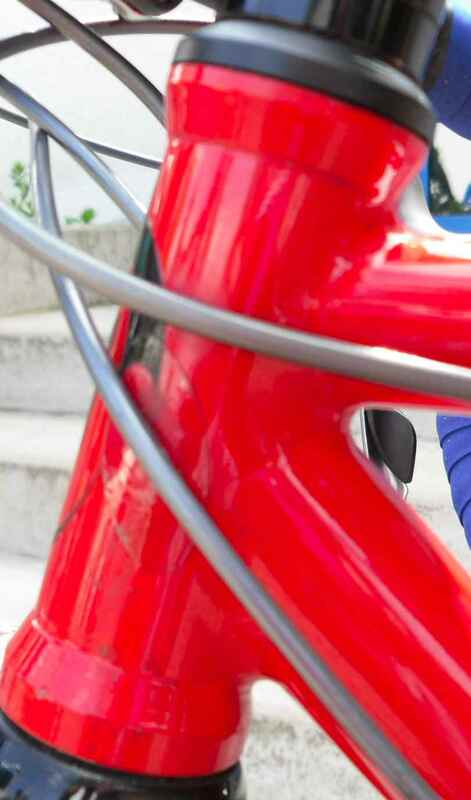 Another sports bike catches the eye, this time a ladies. 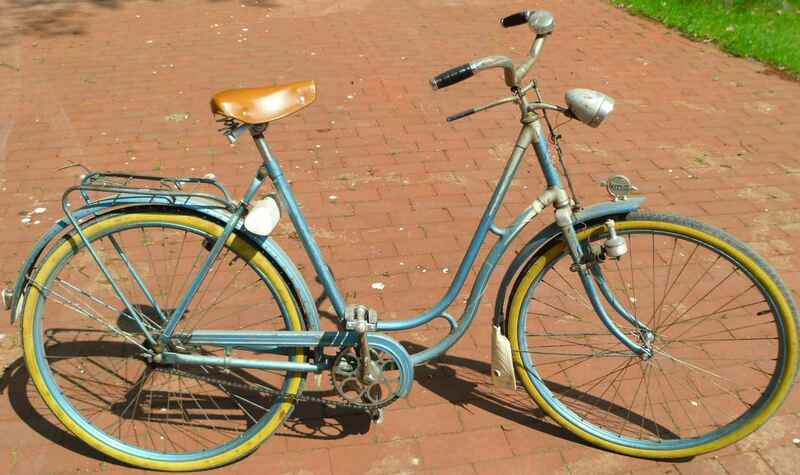 It is in rather good condition, excepting the rims and the gel saddle. 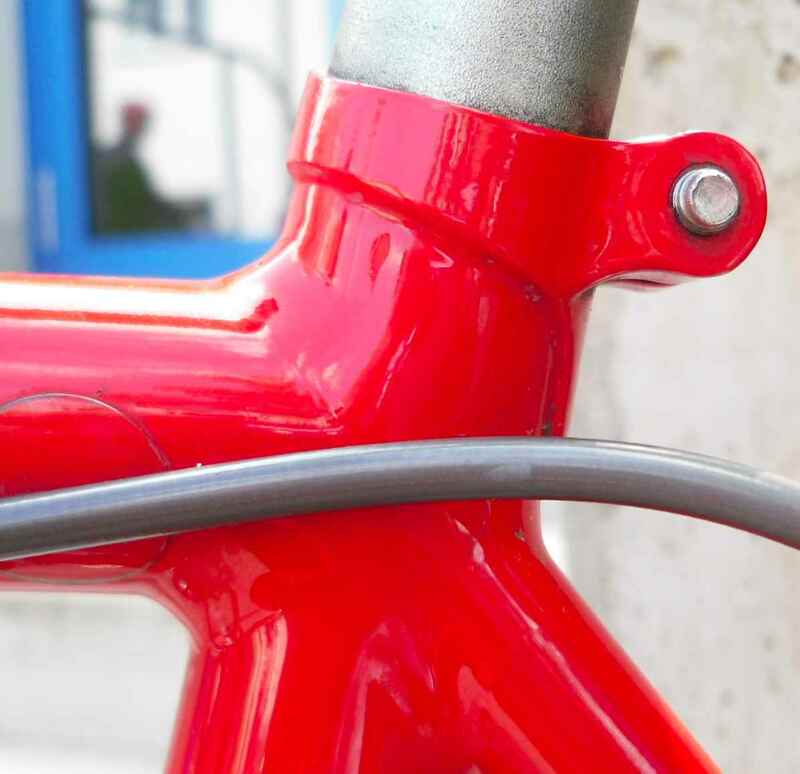 The paintwork and the chrome are outstanding, though, and don´t I just love those rear dropouts. It has a little drum holding the tools on the carrier rack – it even says Miele on it, can´t think why I forgot to snap it. 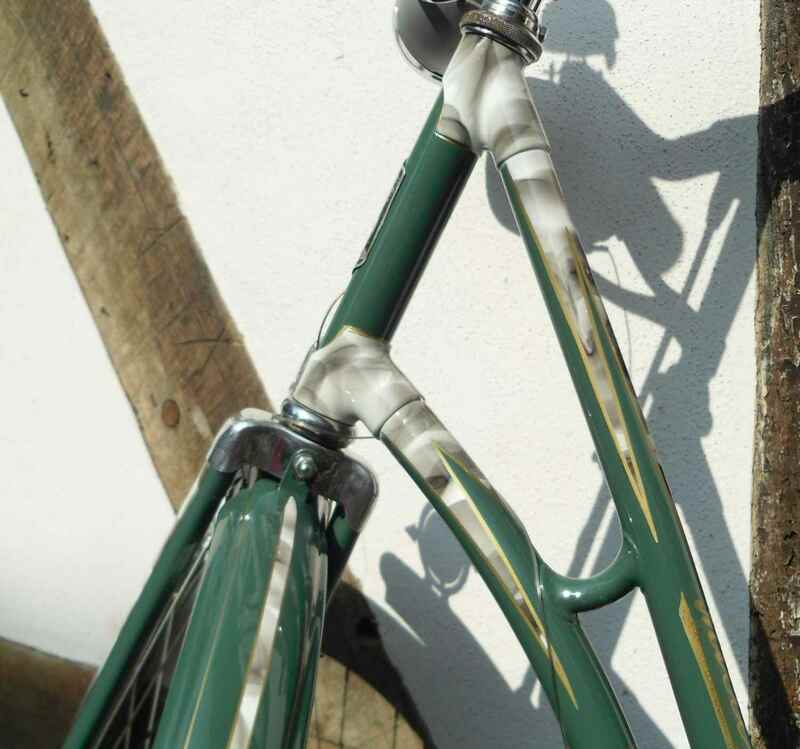 This ladies is restored, in the same shade of green. Very nice work done by a pensioner who used to work in the Miele paintwork department and who knows all the tricks. 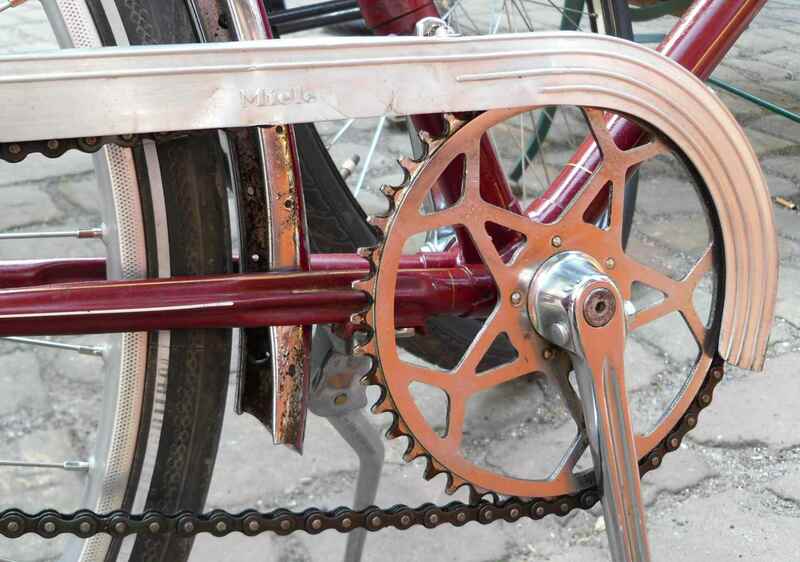 And here´s a genuine mean machine made form a late thirties frame, in the Repack Trail tradition. According to its owner the bike actually gets used off road. 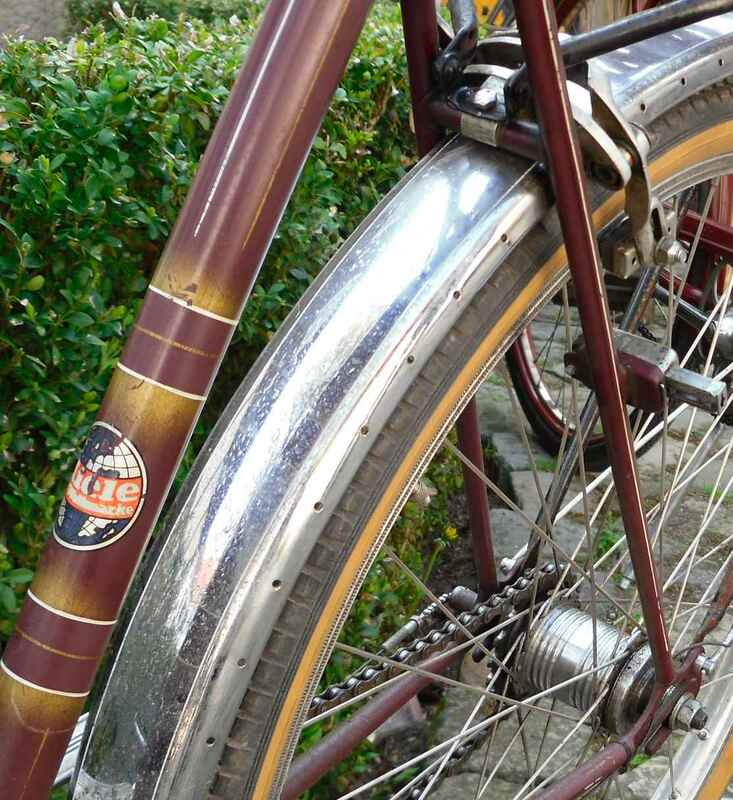 You can see that it´s late (and not early) thirties when looking at the rear end. 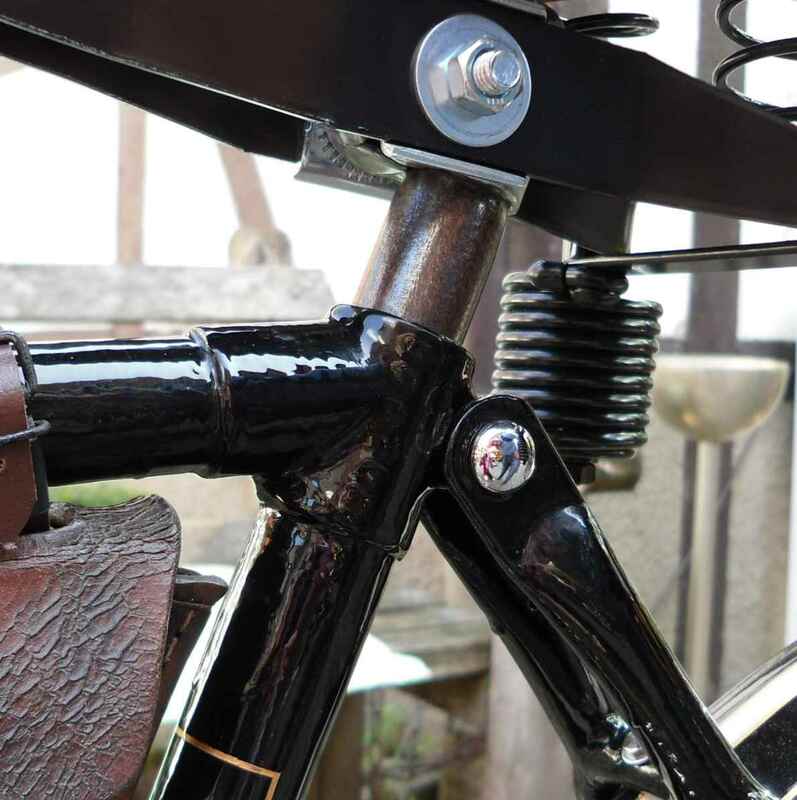 The seat stay it less finely executed than the ones on bikes even less than ten years earlier – see my 1930 frame in the other post. 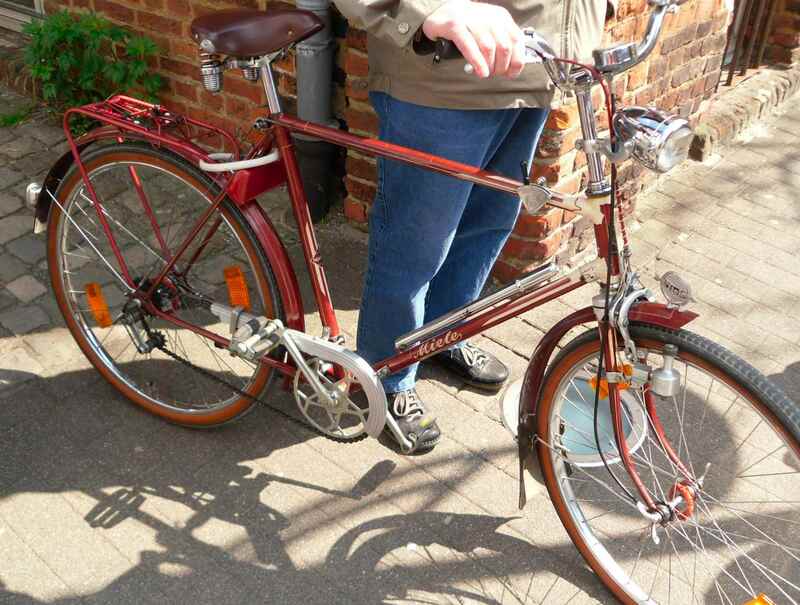 Here´s a Miele Original in red, with the replaced chainguard just the slightest bit off colour. 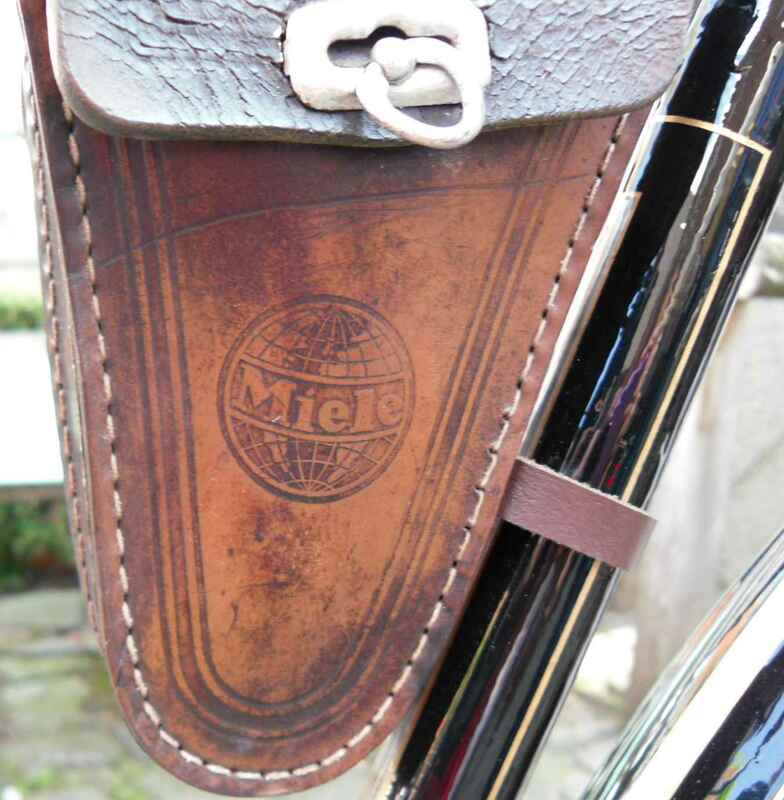 As from the thirties, there were three main ranges of Miele bikes, with Miele Original (Klasse 10 and 14) being the most expensive ones from 95 Marks, Miele Melior (Latin better) (Klasse 11 and 15) at the intermediate price point of about 83 Marks and just plain and simple Miele (Klasse 12 and 16), the lowest, at about 77 Marks in the late thirties. 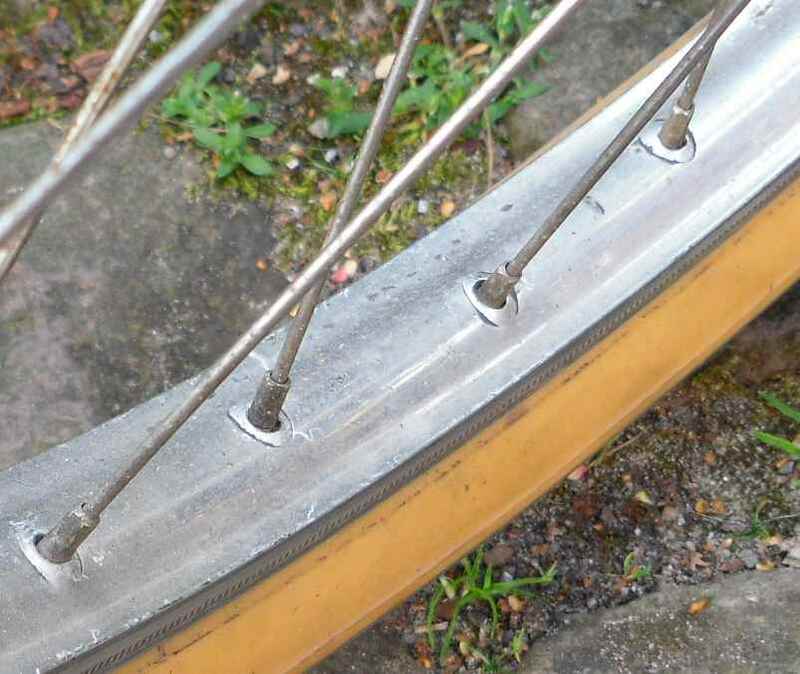 The “Klassen” with the lower numbers designated 28 x 1.75 inch wire on tires, the higher numbers were balloon tires (26 x 1.75 x 2 inch). These again branched out into several other numbers each, what with all the different frame sizes and colours and OEM equipment variants available. 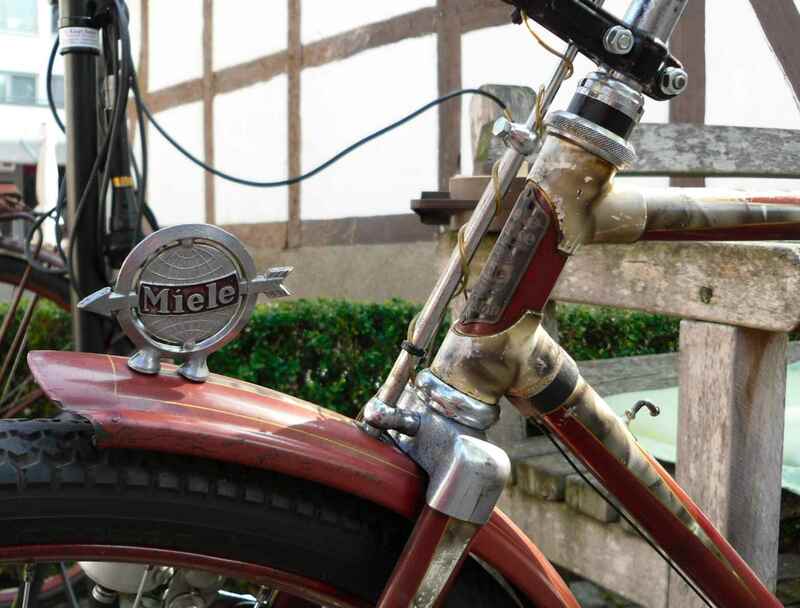 There´s a fascinating choice of scanned leaflets on the Miele historische Technik website. 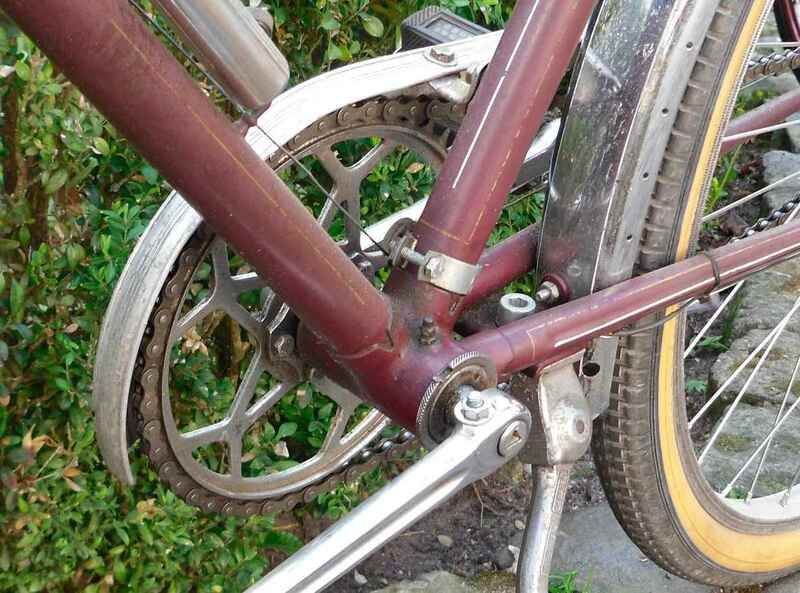 Even the lowly Miele models had the indestructible Miele in house made bottom bracket bearings, and so were very capable bikes, leaving the cheap Komet coaster brake hub aside. 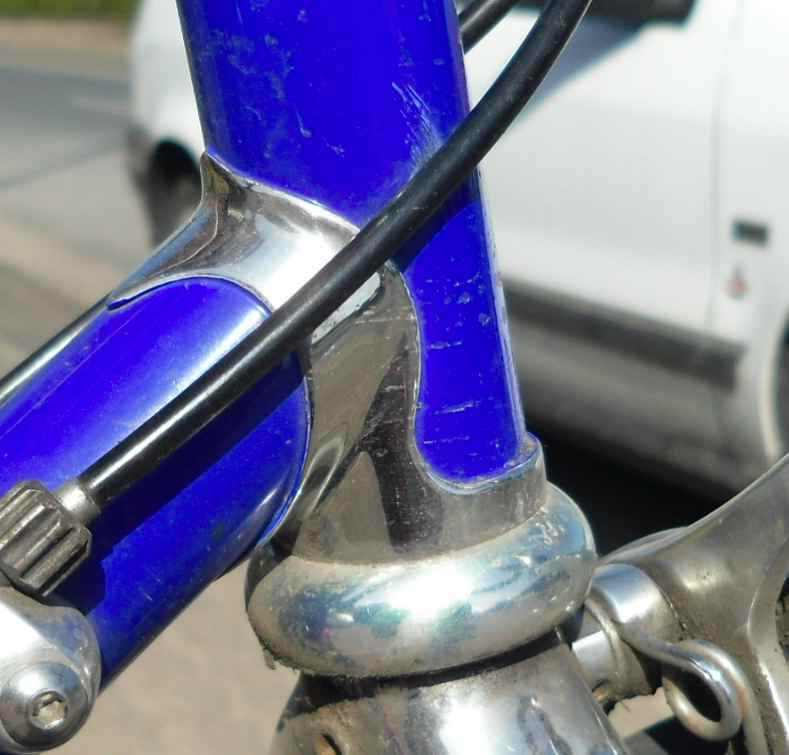 Originals during the fifties sported braze ons for the chainguide and an internal cable routing with cute little ports for entry and exit made up of insulated screw fasten assemblies which connected the well protected cable running inside the frame tubes to the more often replaced cables running in the open. Very clever. 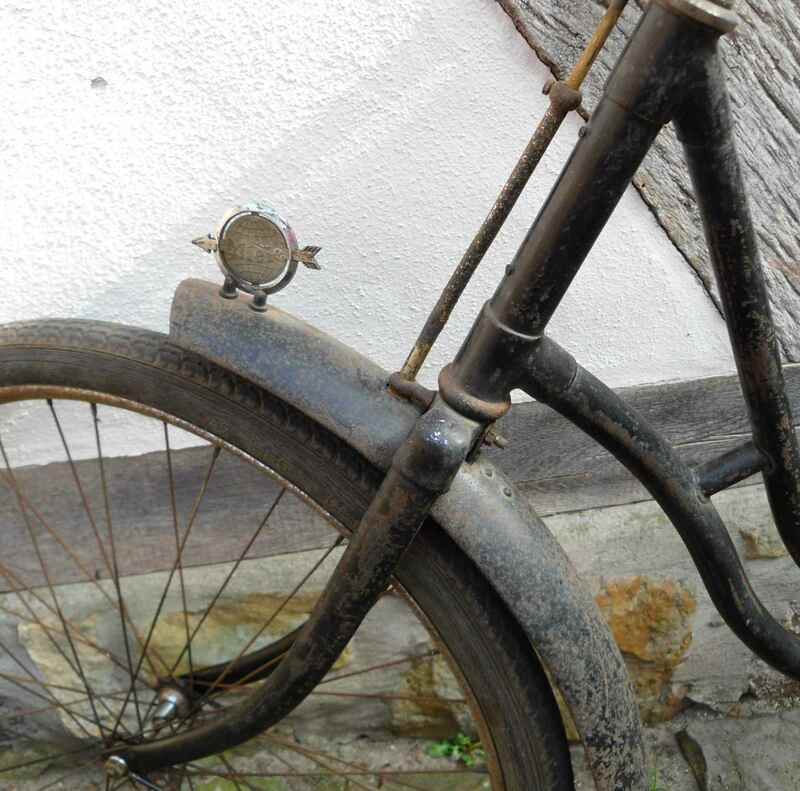 A ladies from the thirties, originally obviously a balloon tired bike. 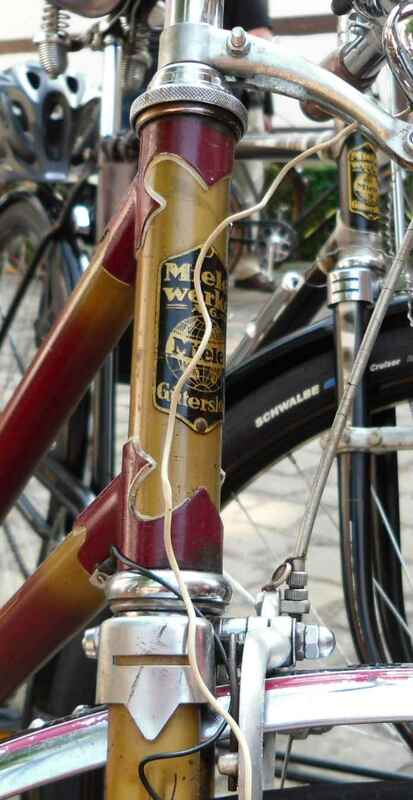 Sad thing the headbadge is missing, it will be next to impossible to replace. 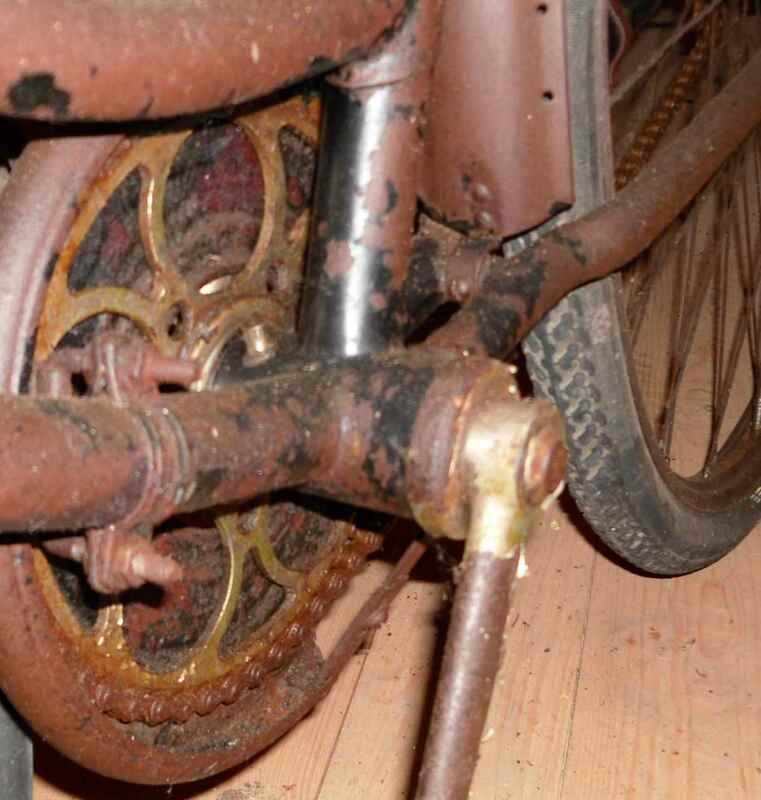 This poor beast has had a fate typical of many thirties bikes. 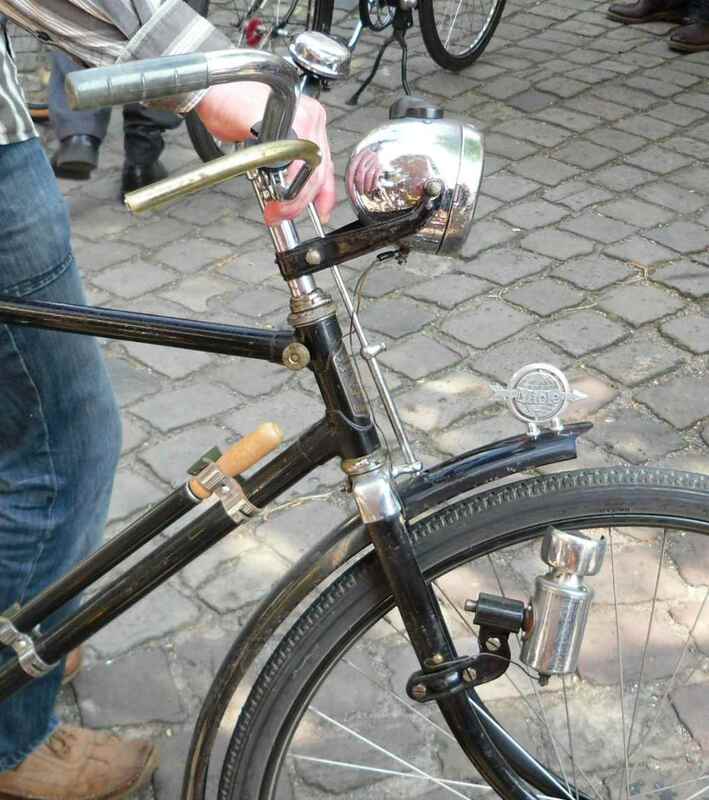 It is pre-WWII as it is equipped with a steering damper. 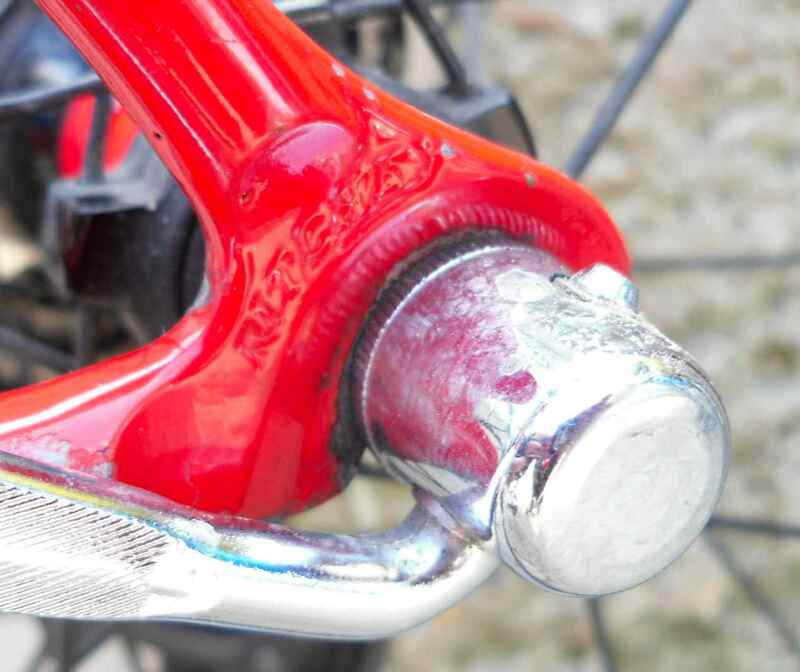 You twist the knurled knob and a band is pulled tight around the fork column; a great thing on bad roads. 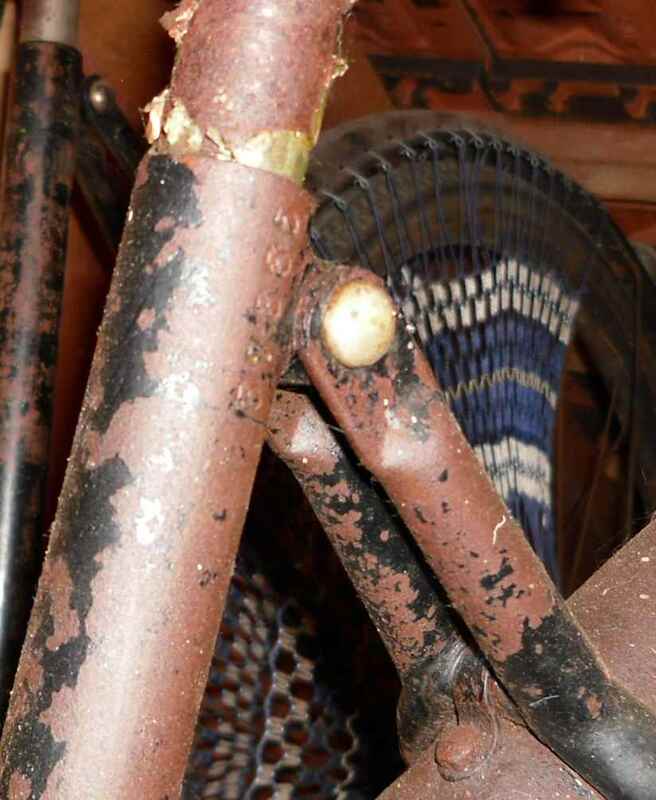 This was dropped after the war, but look how white paint has entered in the thread: This bike was repainted on the cheap in the fifties with the “Strahlenkopf”, the mostly four pronged white and grey adornment near the steering head fashionable at the time, with people not even bothering to disassemble the steering damper. 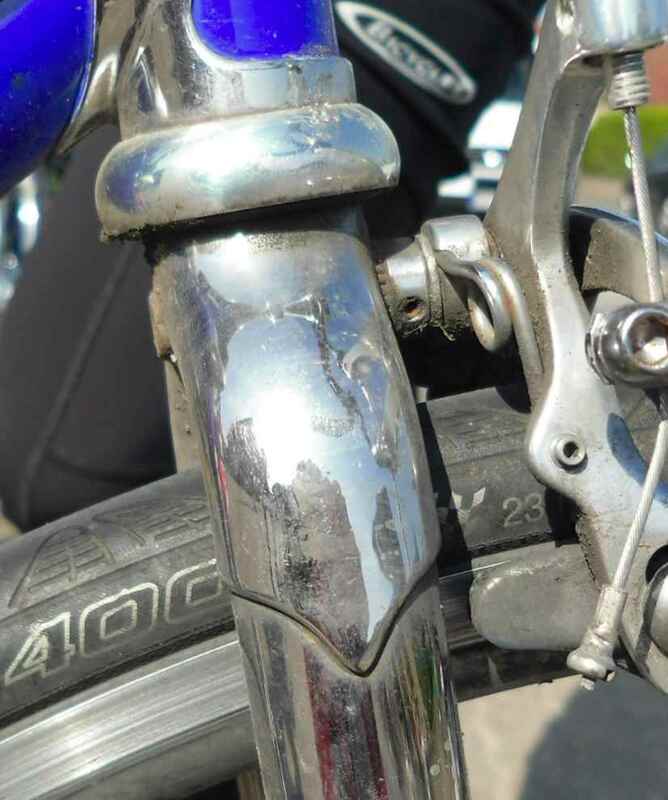 There was one bike in the meet with the damper removed and replaced with a screw to fill the hole. 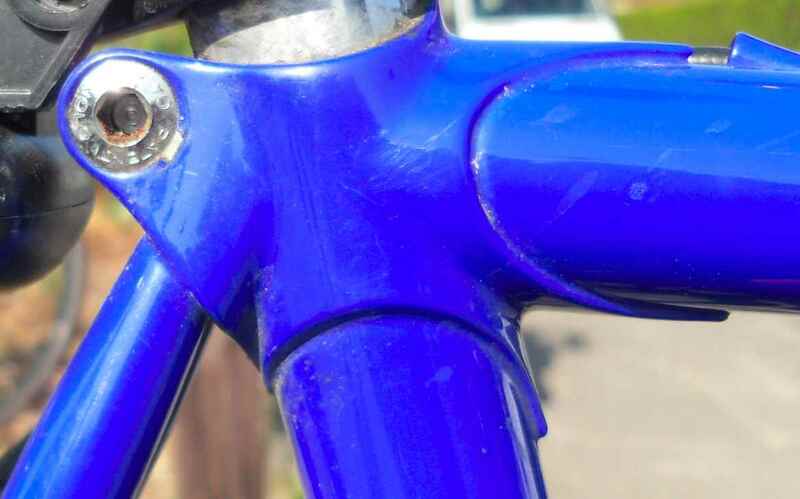 The screw then had been painted over. 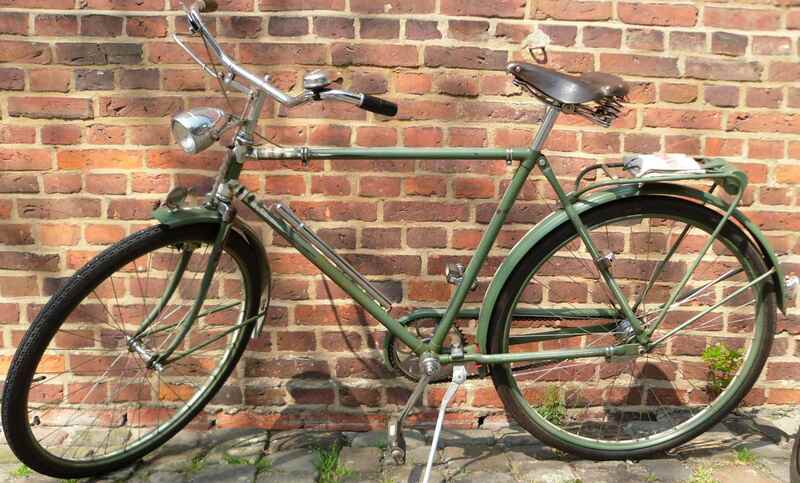 These things were done for reasons of fashion or out of necessity, in the immediate post war years, when new bikes were hard to come by. 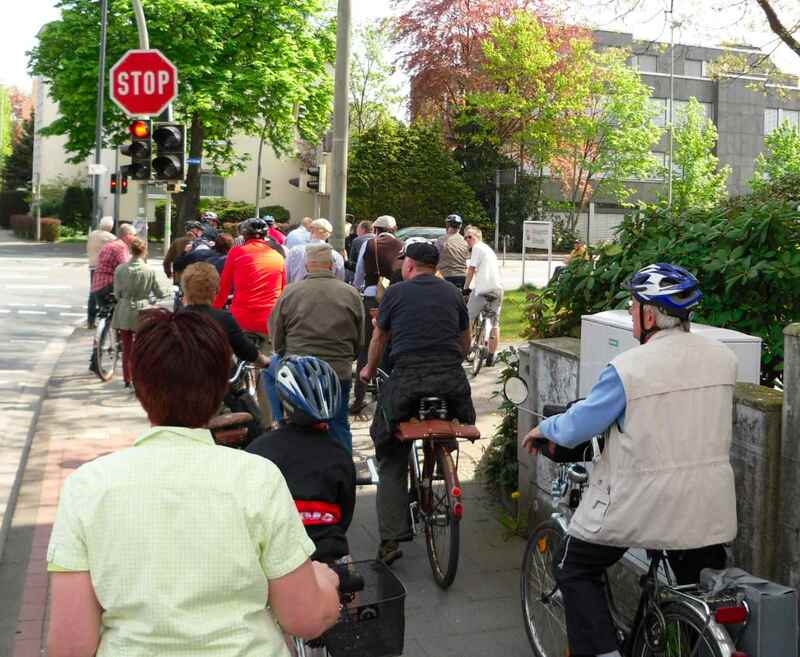 Here the group is setting off, only to be stopped by a red light around the corner. 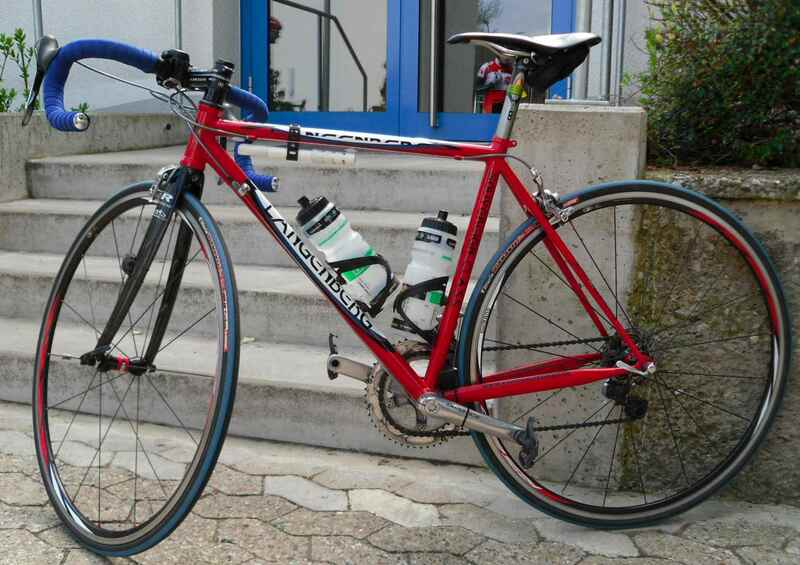 In general the ride was very enjoyable, however at a breathtaking average of about 8 kph, speed was hardly bearable. 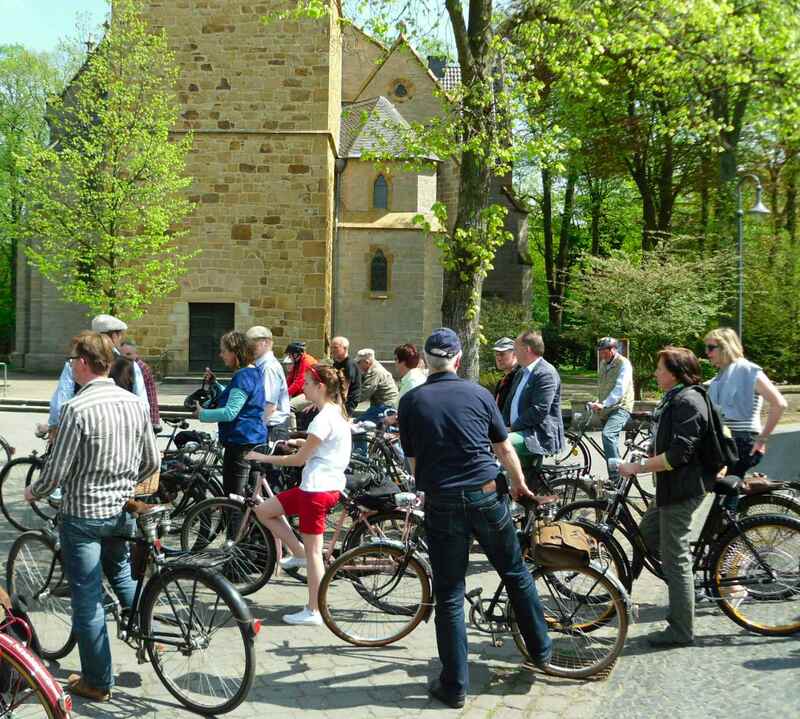 We even had to take a break near a church for people to catch their breaths. 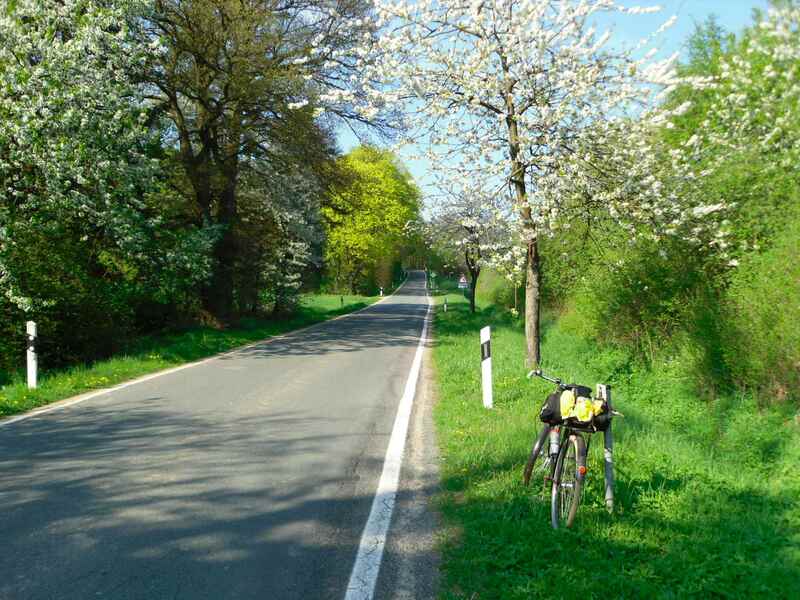 Some of the greenery was spectacular, and after about an hour´s ride we arrived at Hof Kruse where the City of Gütersloh treated all participants to food and drink for which we were all grateful after the strenuous exercise. Seriously, the food was very good and there even was vegetarian potato salad. 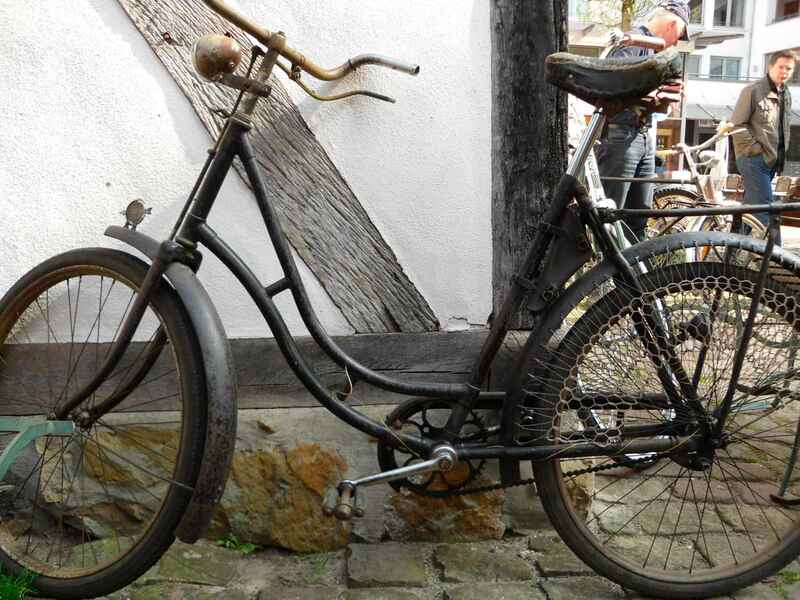 During the ride I had been able to speak to another rider who said that she knew of an attic at a farm in the vicinity where there were a number of very old Miele bicycles, she thought possibly even among the oldest surviving. 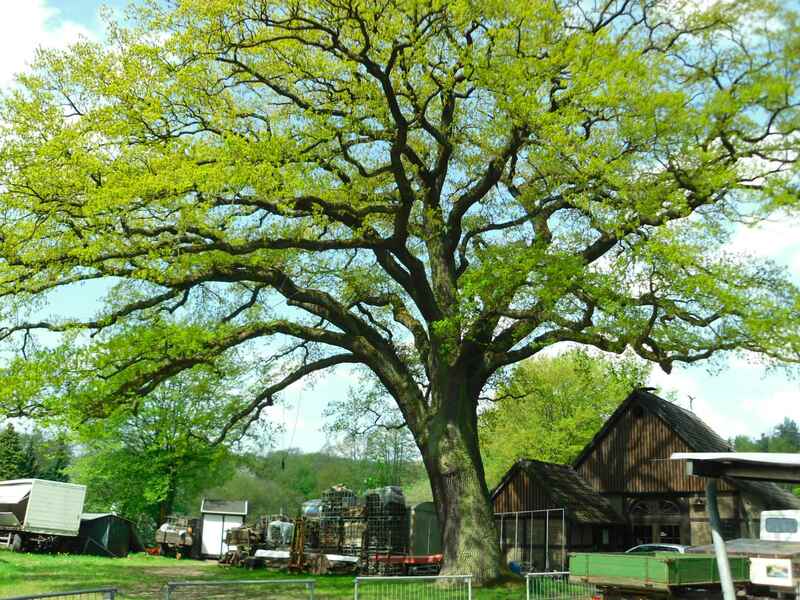 So we cut short the ride, and took off after some minutes feeding, passing this oak on the way. 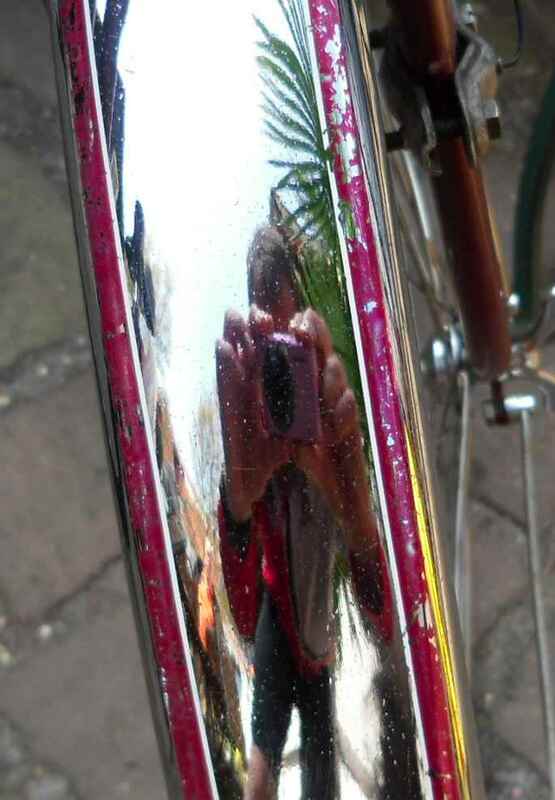 I am under oath not to divulge the whereabouts of the attic, also the bikes in question are not for sale, but the pictures I took were worth the detour, even if conditions were cramped and lighting was difficult. 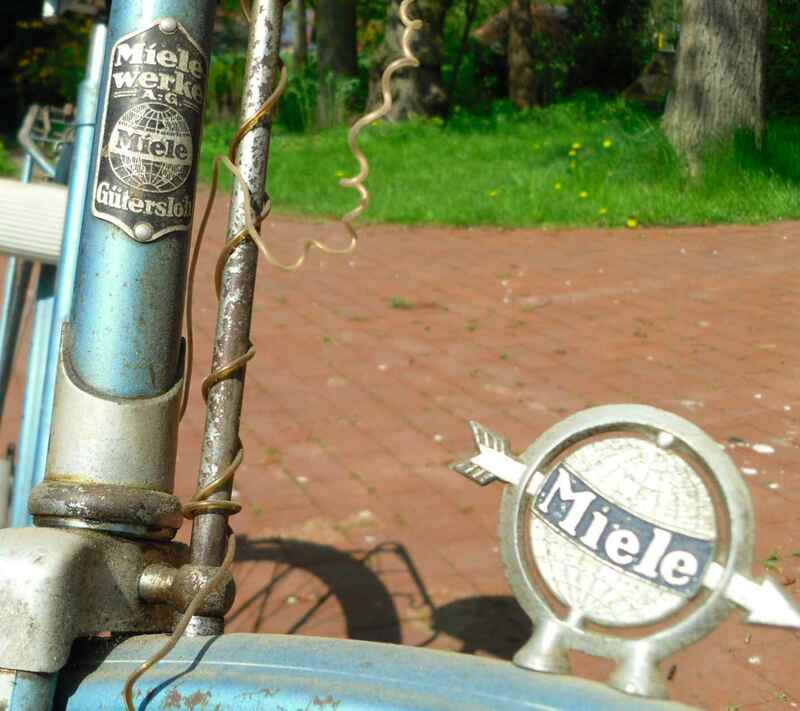 If you find a Miele bike with “Miele Gütersloh” on the headbadge that´s nothing overly special as far as Miele bikes go. 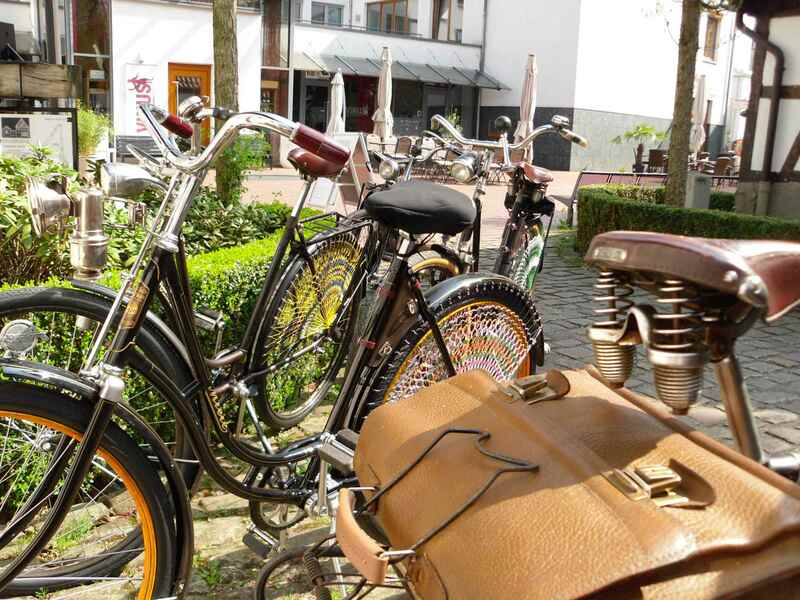 Gütersloh after all is their headquarters and has been for times immemorial. 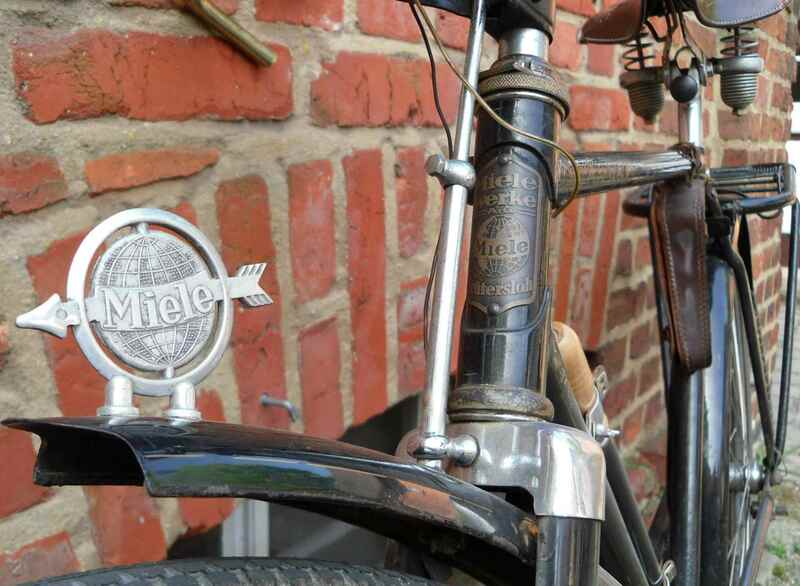 However, if there´s a bike with a “Miele Bielefeld” badge on it, it definitively is as rare as hen´s teeth as those badges were only made during the very first years of production after 1924 when Miele started making bikes in earnest in their Bielefeld cycle factory. 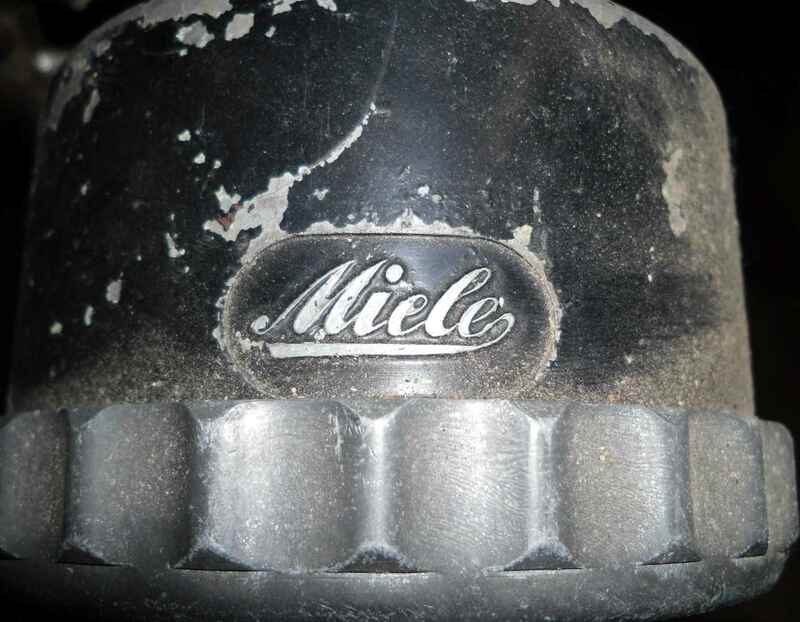 If you find three of those in one attic, you know that you´re in the centre of gravity of the Miele collectors´ world. 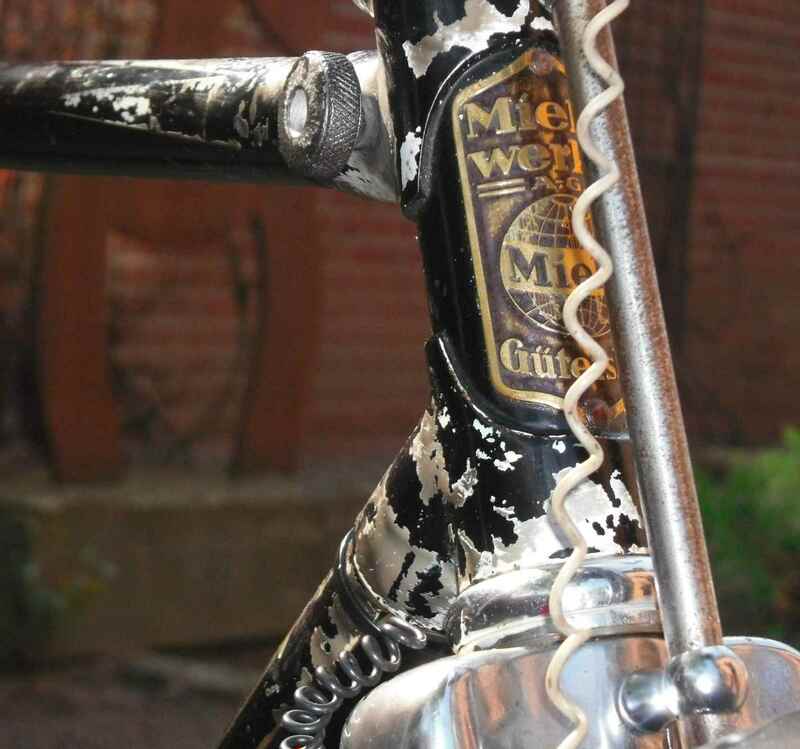 Nickel plating on a Miele – a sensation as such as Miele only nickel plated bikes for about the first six years. 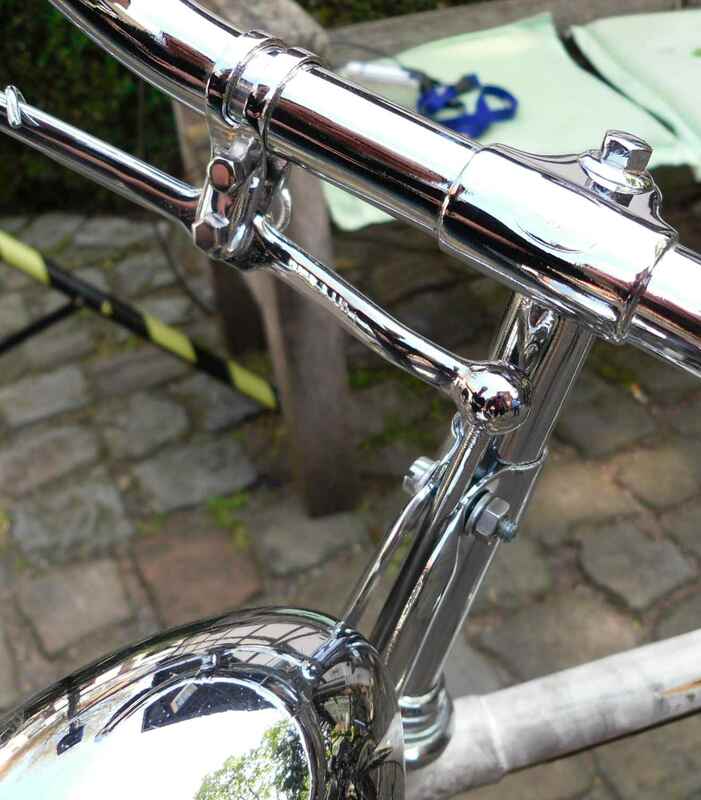 Chrome plating on German bikes was introduced as an extra in about 1928 and was more or less standard on chainsets, handlebars and so forth by 1930. 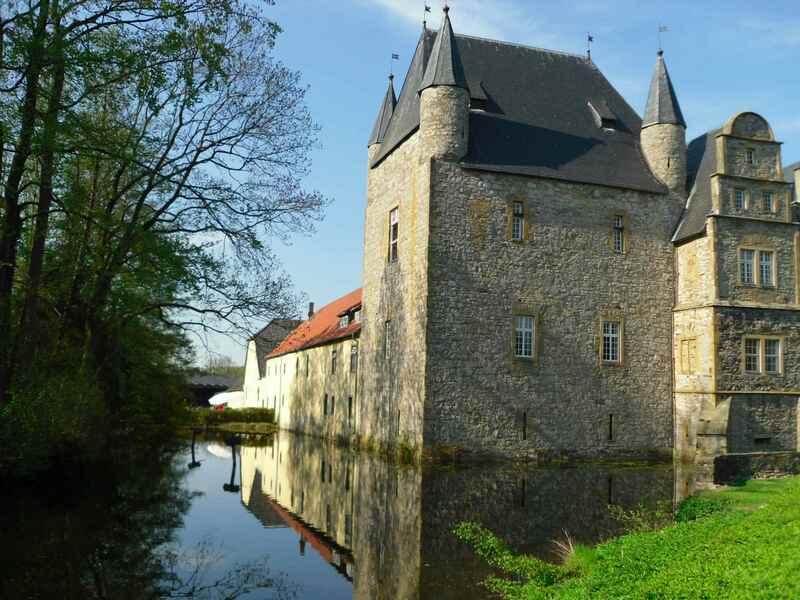 Also on the same farm there is a rather beautiful Melior in fischblau, a shade of blue with a metallic effect, which used to be made from fish skin. 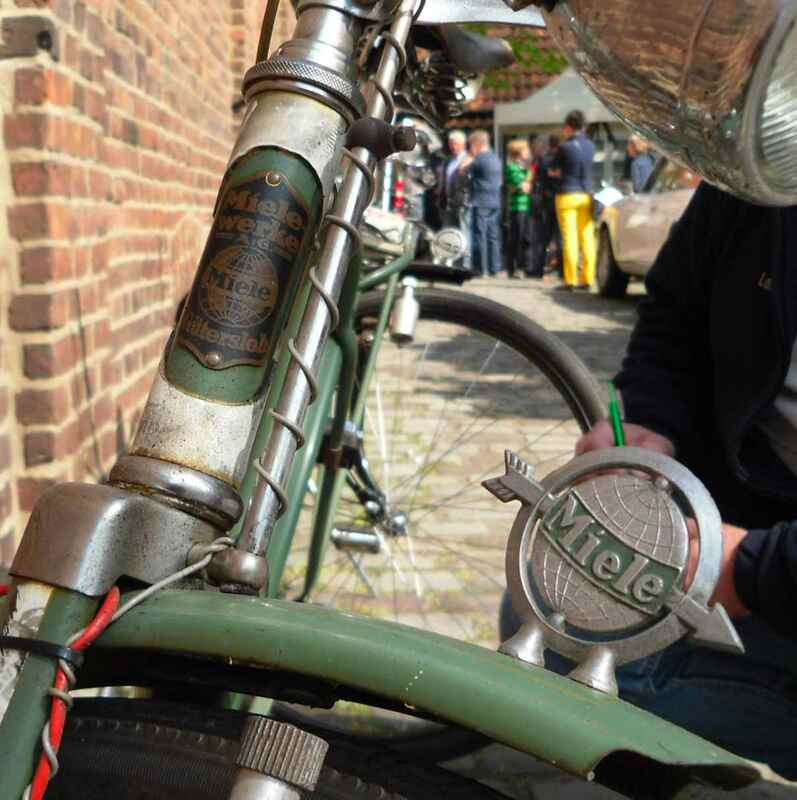 Miele mudguard mascots showcase the background colour of the name in frame colour. 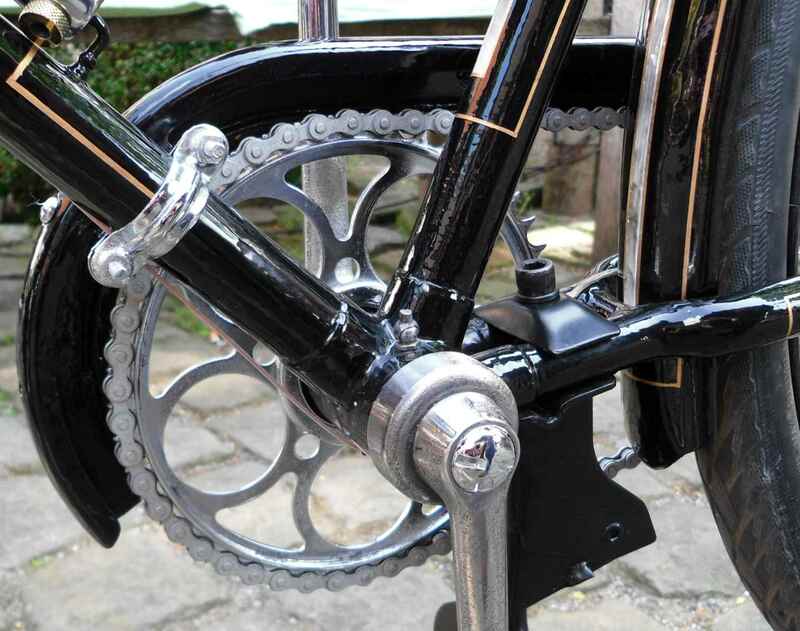 Nice touch, and an instant giveaway if the frame colour has been upgraded from simple and frequently found black to something more flashy during a restauration. 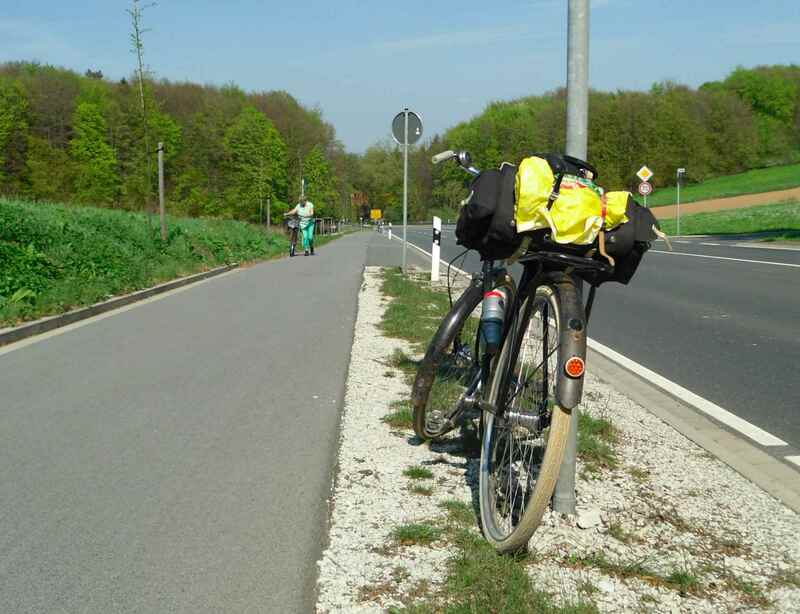 After the visit I started the ride home, now even a bit longer than the way to Gütersloh city centre in the morning. Also the wind had picked up – and turned into a headwind, of course, so my average was much lower than in the morning. 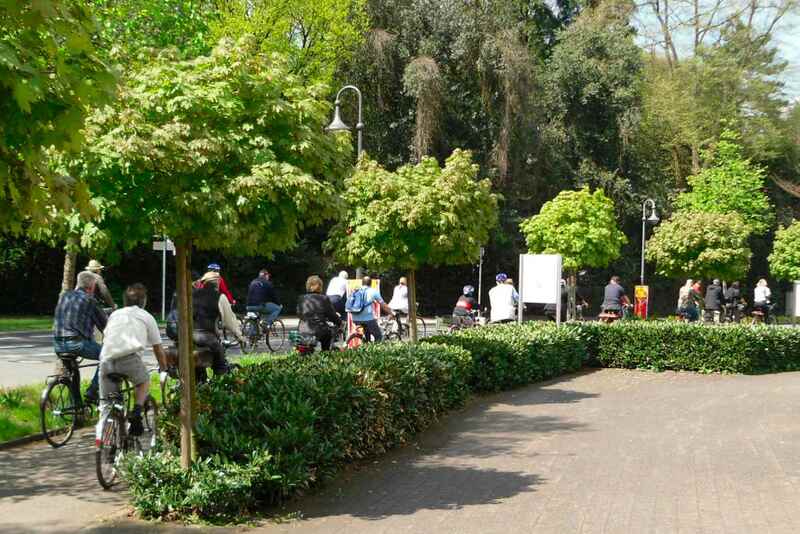 Still, the ride was enjoyable, excepting one near accident when a cycle path ended suddenly and without warning so I had to ride off a high cycle path kerb onto the road. 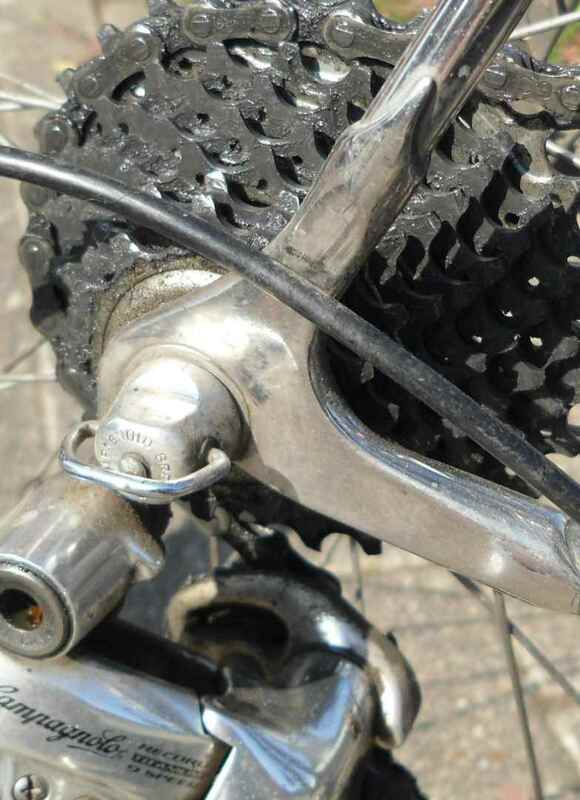 That must have put a strain on the bike, but I haven´t been able to see any damage so far. 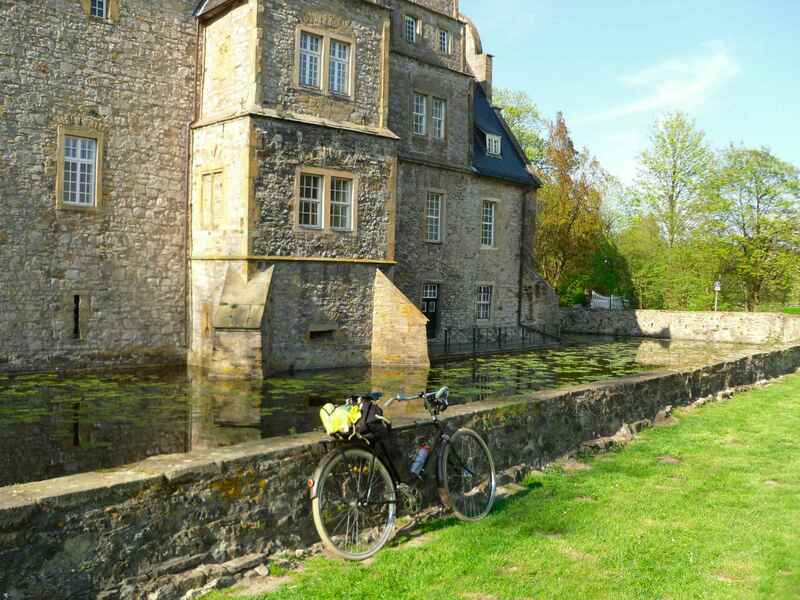 Having only a short distance to cycle I passed Schelenburg moated castle in a great evening atmosphere and couldn´t resist staying for a few minutes. 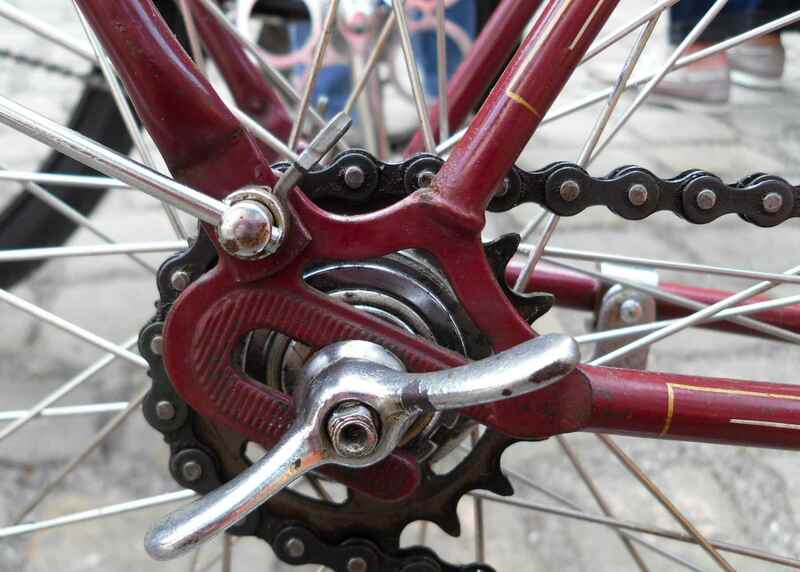 As the elderly lady who had come to the meet to have her bike dated suggested, the best things in life are free. 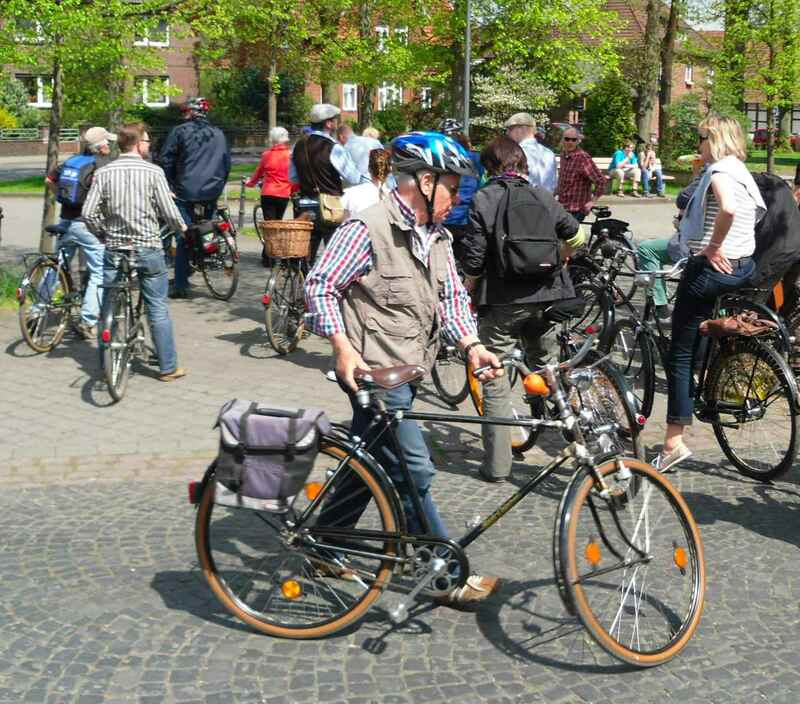 A great 1st of May ride netted some encounters with interesting people and interesting bikes. 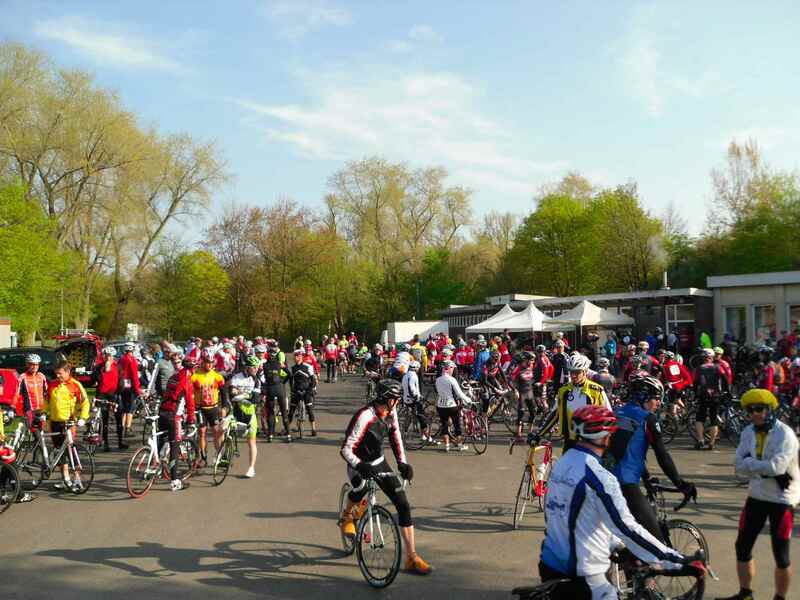 The weather was super, and about 1,000 riders took part, if I remember correctly. suddenly there will be a small group springing up from somewhere. 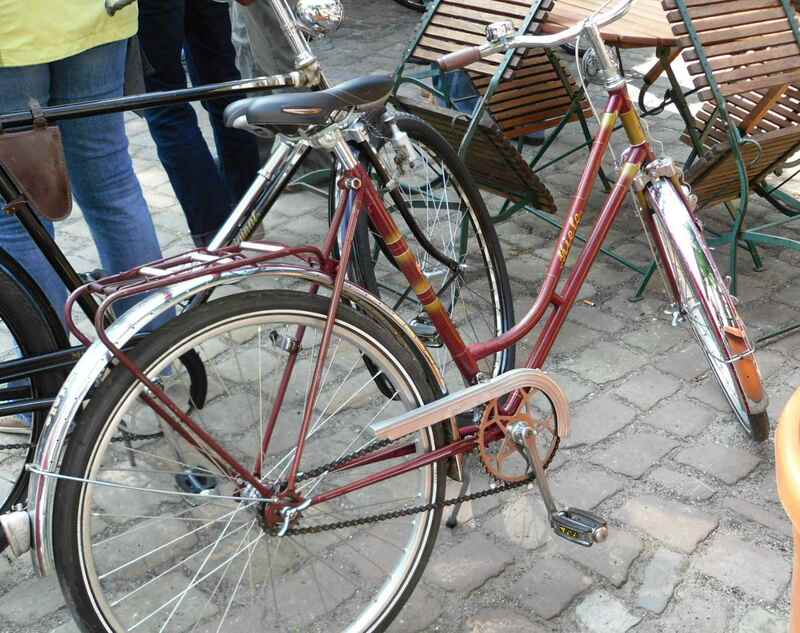 Here is a small selection of the more interesting bikes I saw. 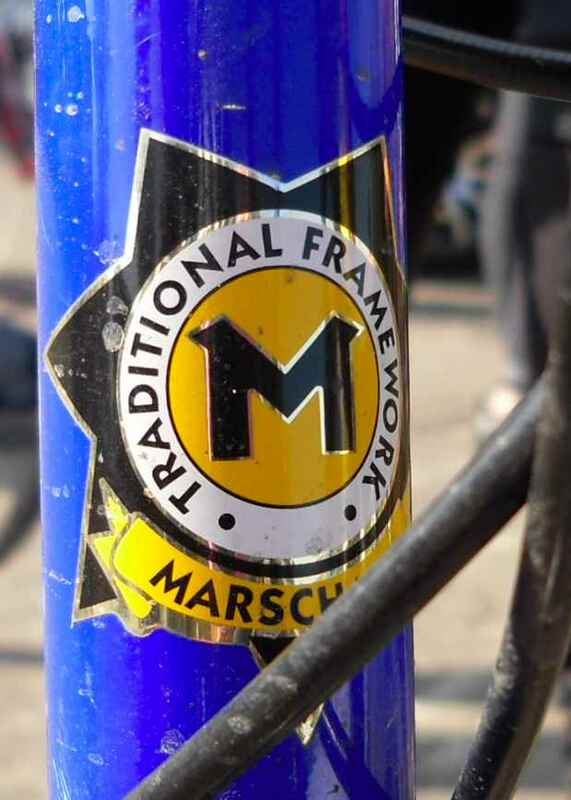 First, there was a very nice Marschall made from stainless steel. But this Langenberg also has its attractions.